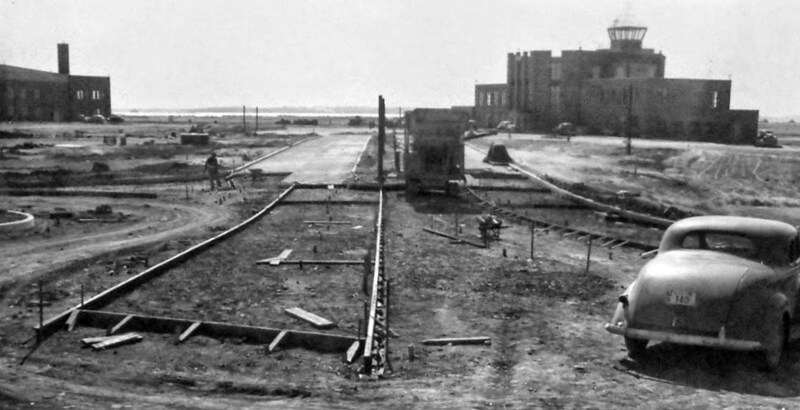 A 1920 photo of Logan Field's terminal under construction. Following WW1, pilots coming home to Baltimore needed an airport. Until then, there were not enough local aviators to justify the creation of a regular field. General Felix Agnus, president of the Park Board, had been approached by the military veterans who asked for an airfield in one of the city parks. In those days airplanes required very little space. General Agnus was the owner of The Baltimore American newspaper. He wanted to find them a field, but knew the city parks would be too dangerous to the public. General Agnus consulted with Mayor William F. Broening, who was enthusiastic at the prospects. 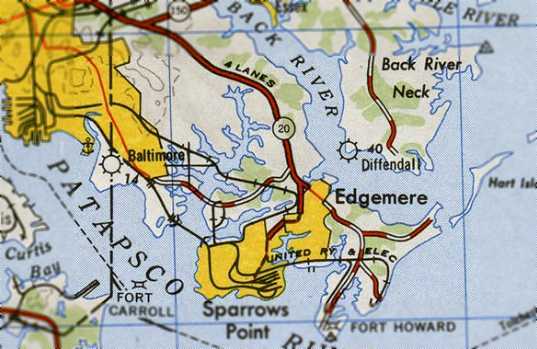 The Maryland Flying Club had found the perfect location near Dundalk. It was just right, a large, level field which that had been a truck farm. The property, however, belonged to the Bethlehem Steel Company. had no objection to the use of the property for flying purposes. They first called it the Dundalk Flying Field. 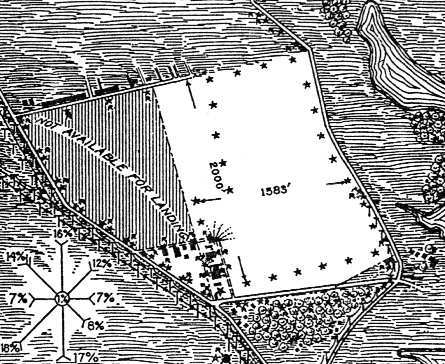 It was approximately 100 acres, and lay between Belclare Road, Dundalk Avenue, and Sollers Point Road. A formal lease agreement was signed & the airfield officially dedicated in 1920.
while performing a tailspin at the site a few months prior to the official opening. 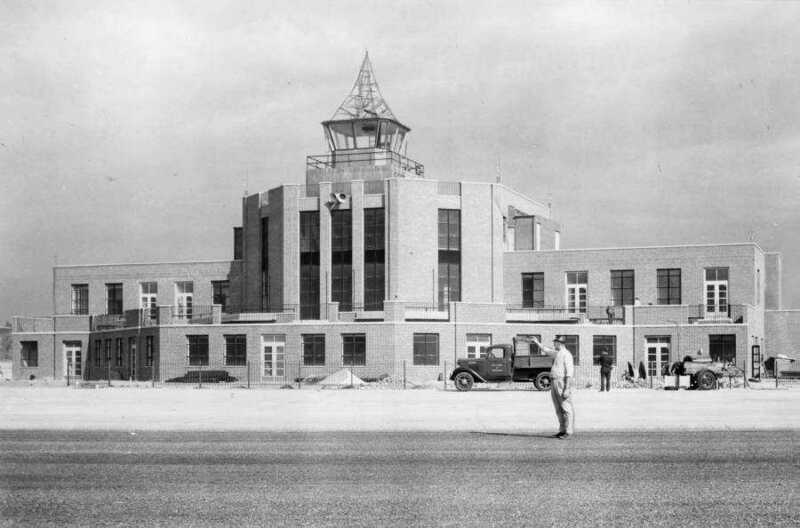 The earliest depiction which has been located of Logan Field was a 1920 photo of its terminal building under construction. 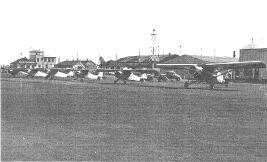 the airport was dedicated to Logan on July 11, 1920, the closing day of the air show in which he had been a participant. and Baltimore Mayor William Broening were principal speakers. and Lt. Harry McGinnes addressed the 4,000 spectators at the dedication. At last, Baltimore had its first Municipal Airport. The deal almost didn't happen. Bethlehem Steel had changed its mind & decided it might need the land after all. The city, however, came up with $2,000 a year rent. The state of Maryland provided $500 in operating expenses. which Logan Field then qualified as. More money for improvements arrived & lights were installed for night flying. Before long, fliers such as Amelia Earhart & Charles Lindbergh were visiting Logan Field. the Maryland National Guard's first flying unit." 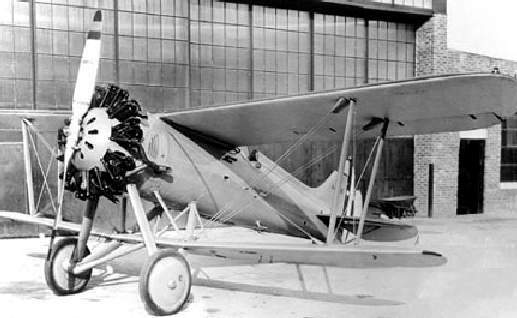 The unit received 13 JN-4D-2 Jennies in 1921. The aircraft were kept in 4 canvas hangars at Logan Field. Most of those first Maryland Air Guard aircraft were in an advanced state of wear. Some had no seat in the rear for the observer. In the air, the Jennies growled, groaned, whistled, and creaked. But despite all those shortcomings, they were considered good ships, powered by good engines. Logan Field was initially a great success. 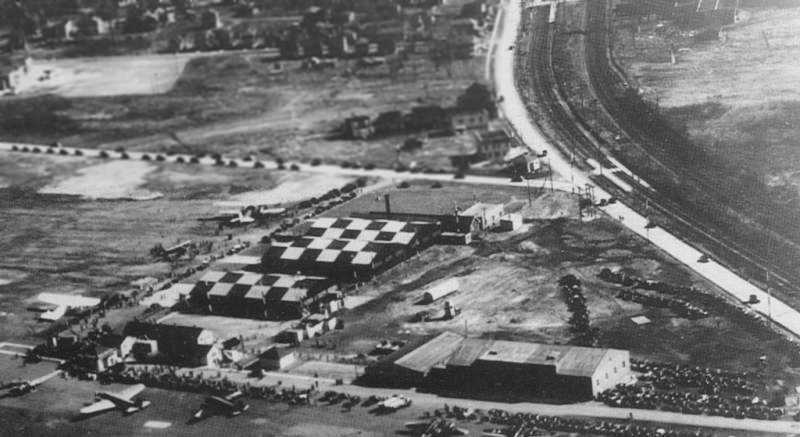 Canvas hangars were built, and by 1922 the field was hosting an annual series of air meets. There would often be captured German WW1 Fokkers, British & French models, plus the latest American biplanes. In the flying-crazy 1920s, Logan Field was the place to be. described Logan Field as a 100 acre irregularly-shaped sod property measuring 2,000' north/south by 1,583' east/west. 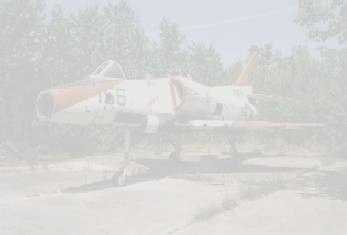 The field was said to have 3 steel hangars measuring 120' x 60'. 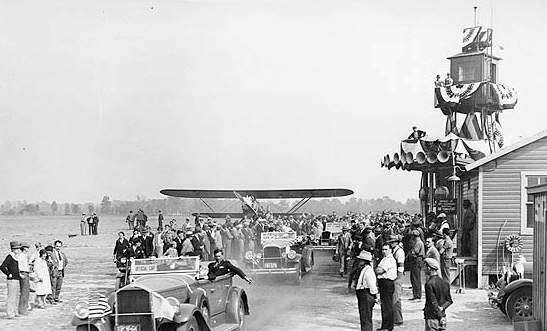 A 5/31/27 photo depicted a large crowd of spectators at Logan in front of 4 biplanes, with another biplane overflying. with 2 light planes parked near a row of hangars on the southwest side, one of which had “Logan” painted on its roof. A 5/19/28 photo by Edwin Severn of 3 unidentified biplanes at Logan Field (courtesy of Mary Severn Hodge). In 1929 the Post Office began airmail service to Logan Field. At the Logan air meet in 1929, 30,000 people cheered a new air speed mark of 258 mph. "In some respects, 1929 marked the height of Logan's glory. The opening of a Department of Commerce office there made it the headquarters for Maryland & Delaware aviation,"
reported The Baltimore Sun in a 1948 article. described Logan Field as being 2,300' x 1,800' in size. 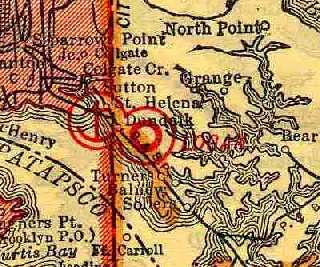 was on the 1929 Washington to New York City Air Navigation Map #3. 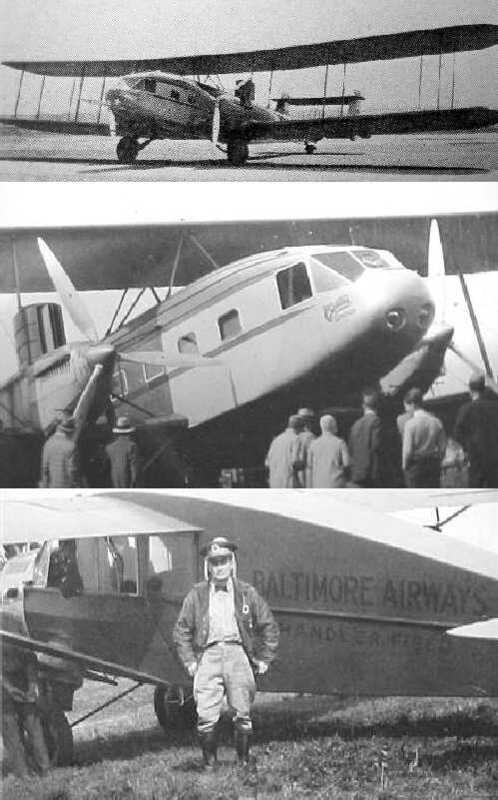 Baltimore Airways inaugurated the first daily scheduled flights between Baltimore Logan Field & New York in 1929. Baltimore, Washington, New York, Camden & Atlantic City. It charged $25 from Baltimore to New York & $40 for round-trip. Later, there was a biweekly flight to Miami, Florida. An undated photo (circa 1920s/30s?) photo of a Curtiss JN-4 Jenny in front of several hangars at Logan Field. including a Curtiss CO Condor & a Bellanca CH-300 Pacemaker. The Bellanca was also marked with “Handler Field” - another early airfield on the northwest side of Baltimore. depicted “Baltimore Municipal Airport” adjacent to “Logan Field, City of Baltimore Municipal Airport (Temp)”. 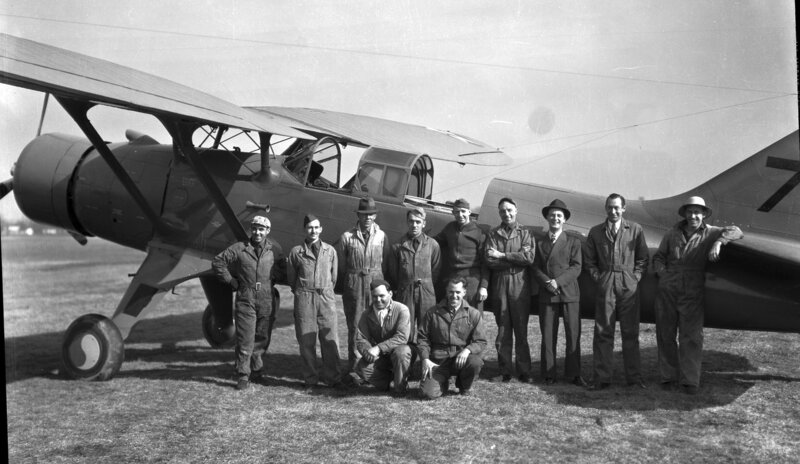 A 10/20/30 photo of MD National Guard 104th Observation Squadron pilots in front of one of the unit's O-11 Falcons at the unit's home station, Logan Field. and William Tipton (4th from left), who commanded the squadron from 1924-29. 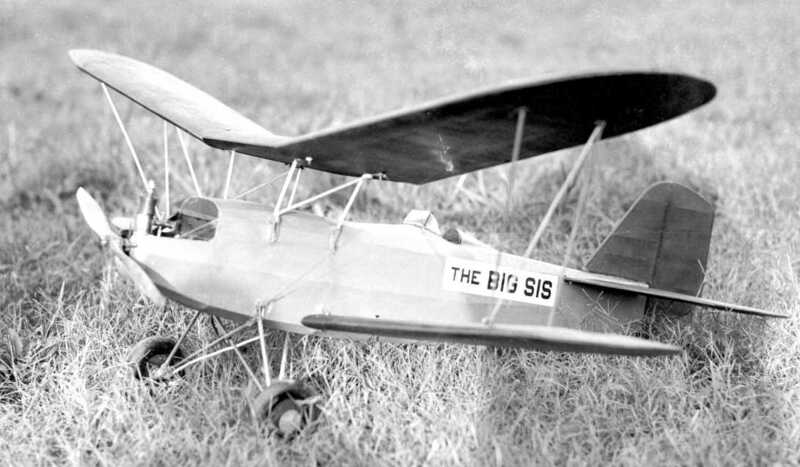 “The Boyd Aircraft Model C was created by the Boyd Brothers out of Baltimore during the early 1930s. the airfield at Logan consisted of a 2,000' x 1,583' sod field. and the operator was the City of Baltimore. showing a variety of single & twin-engine monoplanes & a large twin-engine biplane. The prim clapboard building, with "BALTIMORE" painted in big letters across its roof & a small front porch, was no larger than a 2-car garage. The date of the photo was reported as 1931, but the aircraft (& cars) appear to be of a somewhat later vintage. 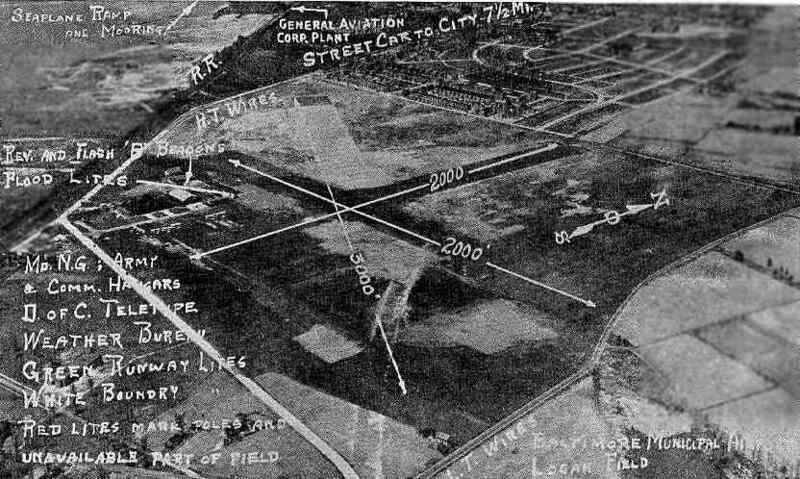 By 1932 Logan Field had a 3,000' runway & two 2,000' runways. 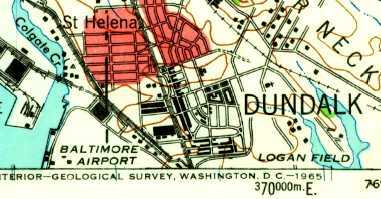 It was depicted as "Baltimore Municipal" Field on the May 1932 J-18 Washington D. C. Airway Map (courtesy of Chris Kennedy). with the longest being a 3,000' asphalt & cinder northwest/southeast strip. A cluster of hangars was depicted at the southwest corner of the field. The manager was listed as Louis Rawlins. 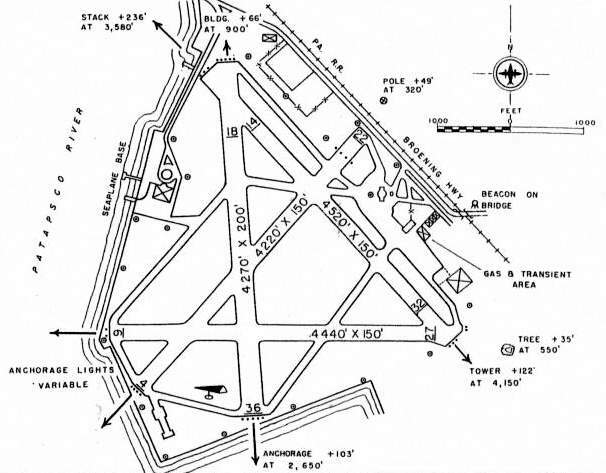 Logan Field, as depicted on the 1934 U.S. Navy Aviation Chart (courtesy of Chris Kennedy). having a 2,800' square sod field within which were a 3,000' dirt northwest/southeast runway & 2 shorter cinder & turf runways. An 11/7/35 aerial view by the MD National Guard's 104th Observation Squadron (courtesy of Wayde Minami) looking southeast at Logan Field. described Logan Field as a municipal airport, consisting of a rectangular sod field, measuring 2,800' x 2,000'. 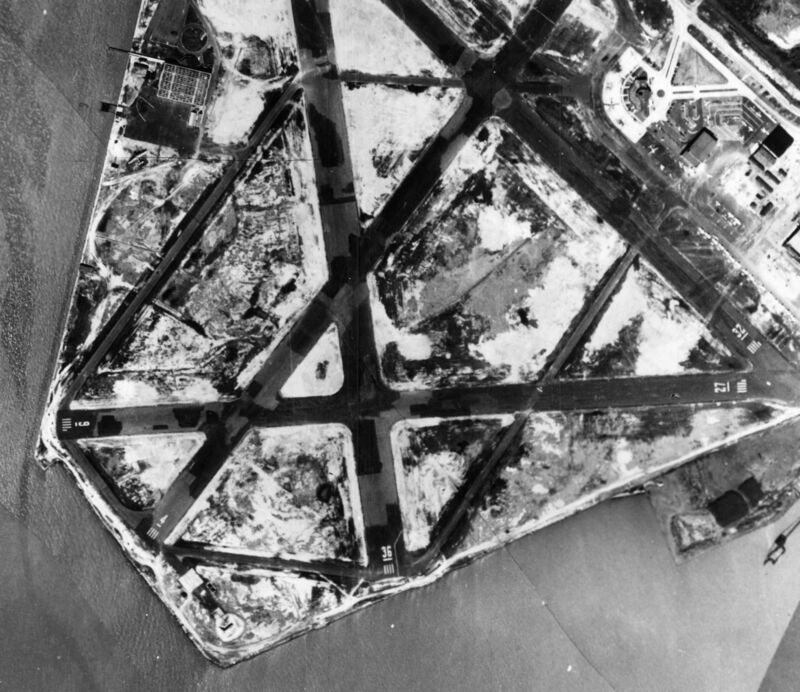 It was said to have 2 turf & cinder runways: 2,100' east/west & 1,900' north/south. The field was said to be an operating base for MD National Guard & Army Air Corps Reserves. Pat Romano operated Logan Flying Service starting in 1936, providing flying lessons in a Piper E-2 Cub. and the Pennsylvania-Central Airlines Corporation inaugurated service in 1937.
showing several checkerboard-roofed hangars, and a number of biplane & monoplane twin-engine aircraft. The directory described Logan Field as having 3 cinder/oiled runways, with the longest being 3,230'. 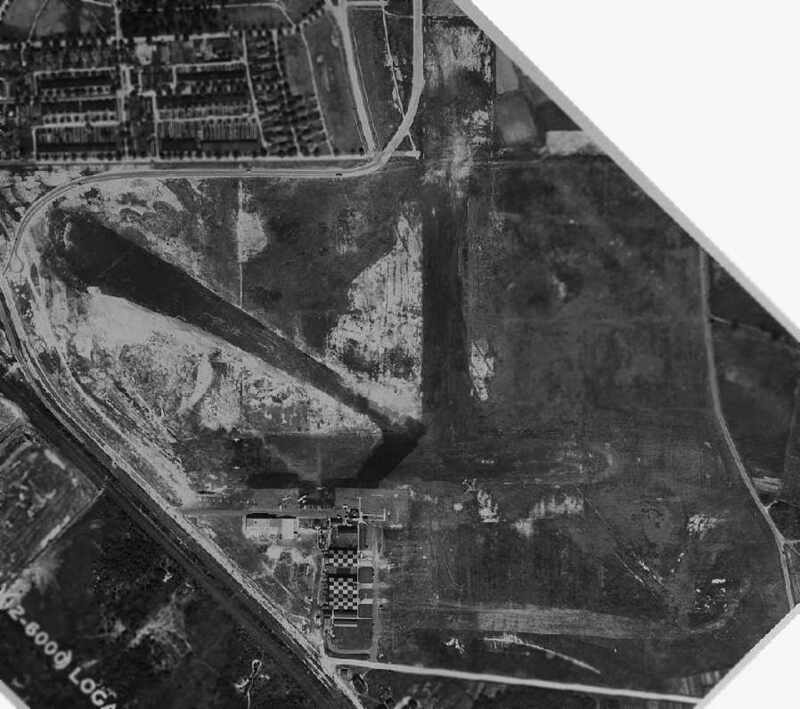 The aerial photo in the directory depicted a cluster of buildings & hangars at the southwest corner of the field. A 1937 photo of a Curtiss Condor at Logan Field. A 1937 photo of a biplane at Logan Field. showing the north/south & east/west grass runways, checkerboard-roof hangars, and several planes on the field. Also note the Berliner-Joyce aircraft factory to the south of the airfield. 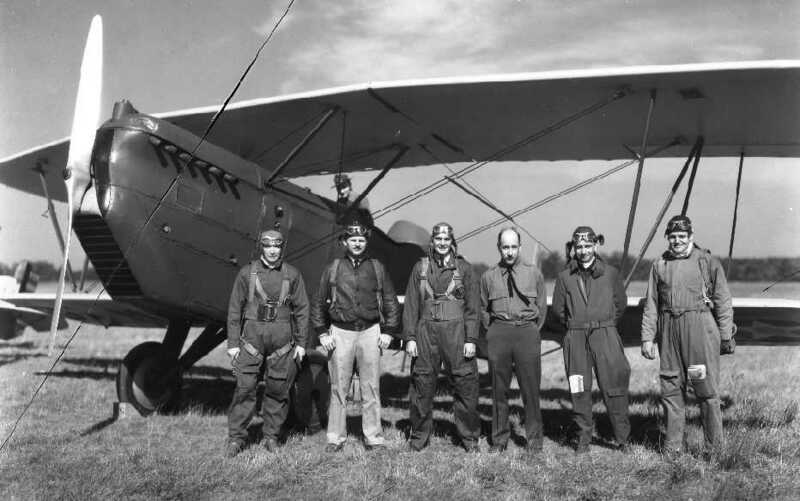 A 2/10/38 photo of the MD National Guard's fulltime Air Technical Detachment in front of one of the 104th Observation Squadron's Douglas O-46 observation planes at Logan Field (courtesy of Wayde Minami). 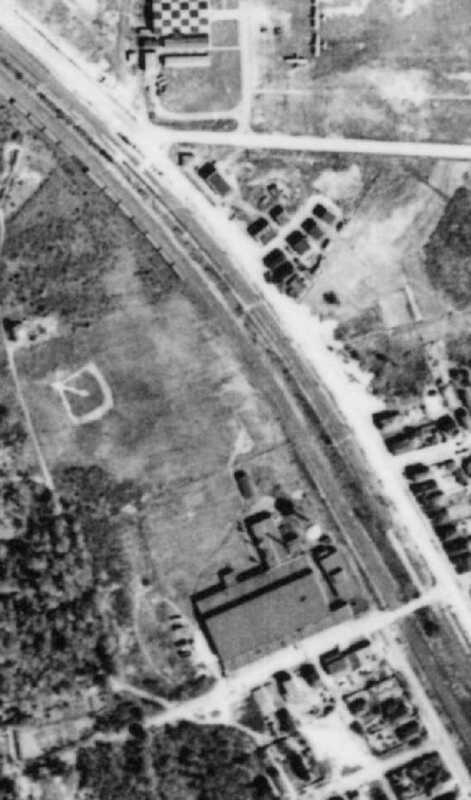 A September 1938 aerial view of Logan Field (courtesy of the National Archives, photo # 18-LMU-V1-850G). Note the DC-2 or DC-3 just southeast of the runway intersection. 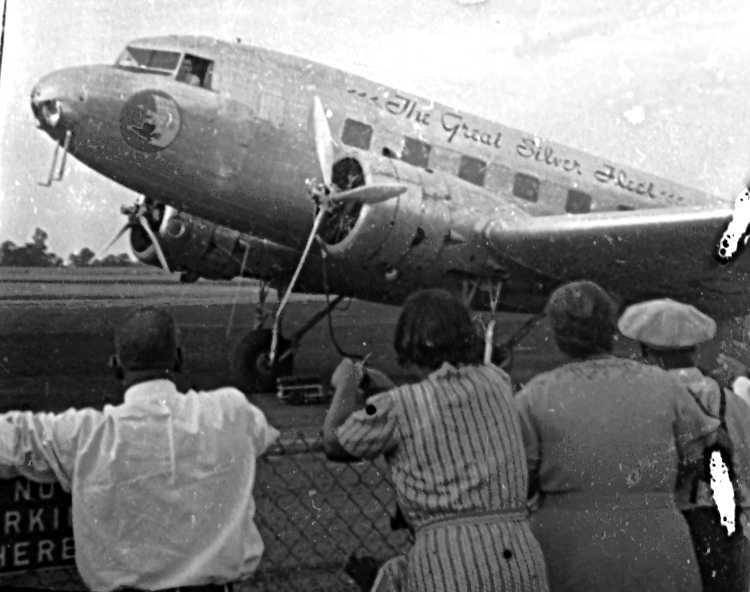 a DC-3 was the largest plane ever to land at Logan Field. An undated (circa 1930s?) view of hangars at Logan Field. Undated photo of planes at Logan Airport. having 3 runways, the longest being a 3,230' northwest/southeast turf & oil strip. A 4/24/39 photo depicted a Douglas DC-2 airliner landing at Logan Field, with the control tower & hangars in the background. along with a DC-2 & 3 other high-wing monoplanes. 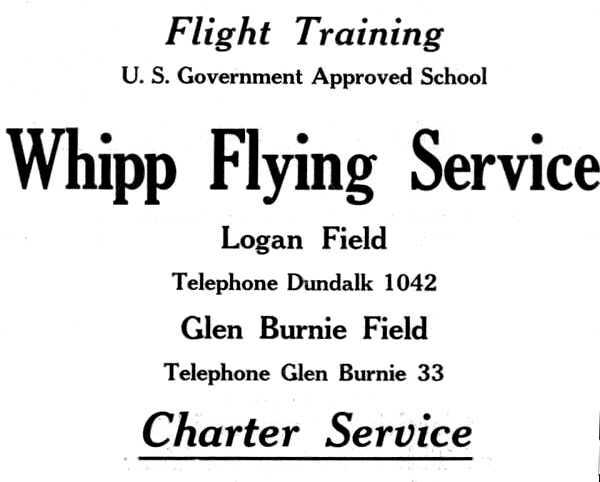 A circa 1940 advertisement for Whipp Flying Service, at Logan Field & “Glen Burnie Field”. Inexplicably, Logan Field was not depicted on the 1940 Washington Sectional Chart (courtesy of Mike Keefe). 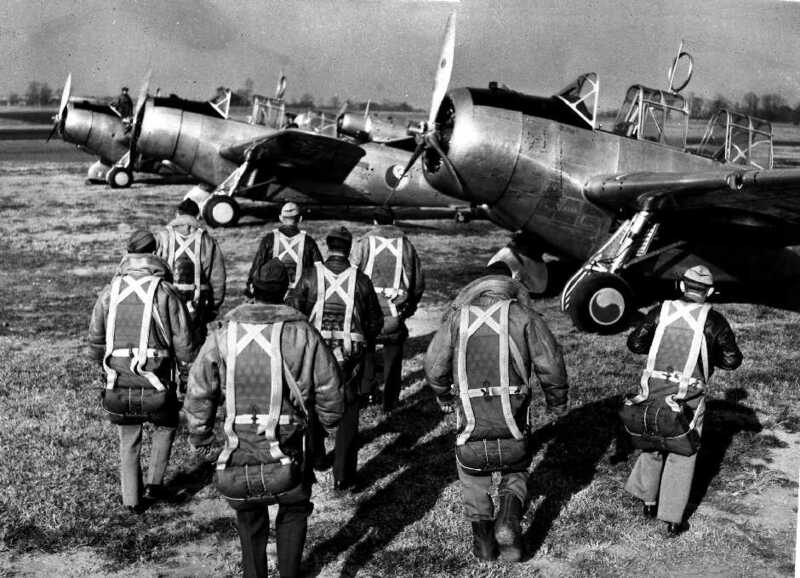 A 3/1/40 photo of aircrew of the MD National Guard's 104th Observation Squadron boarding their O-47 aircraft at Logan Field for a training sortie. 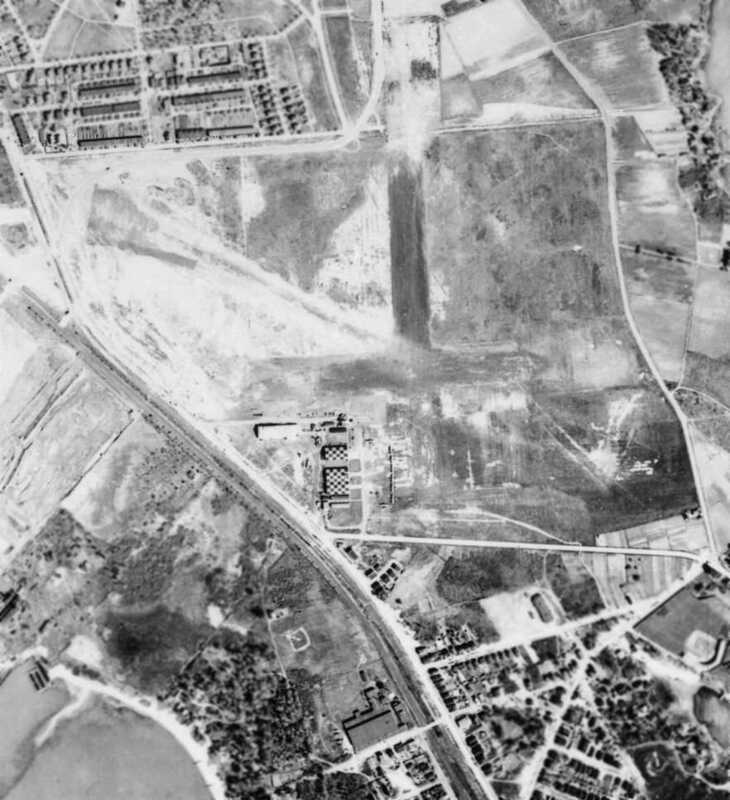 A 9/6/40 aerial view looking east Logan Field showed several aircraft parked on the south side. A summer 1940 or 1941 photo by Fred & Clara Klaburner (courtesy of Fred Klaburner Jr.) of an Eastern Airlines DC-2 landing at Logan Field. of the boarding stairs of “Eastern Airlines, The Great Silver Fleet” with one of their DC-2s at Logan Field. A summer 1940 or 1941 photo by Fred & Clara Klaburner (courtesy of Fred Klaburner Jr.) of an Eastern Airlines DC-2 at Logan Field. and also depicted “Baltimore Municipal Airport” across the street to the west. and averaged 2,000 flying hours annually for 2 decades, all without a fatality. was on the 1942 Washington Sectional Chart (courtesy of Mike Keefe). when it was closed by the government on account of the war. Baltimore City held a lease on the property until February 1943. 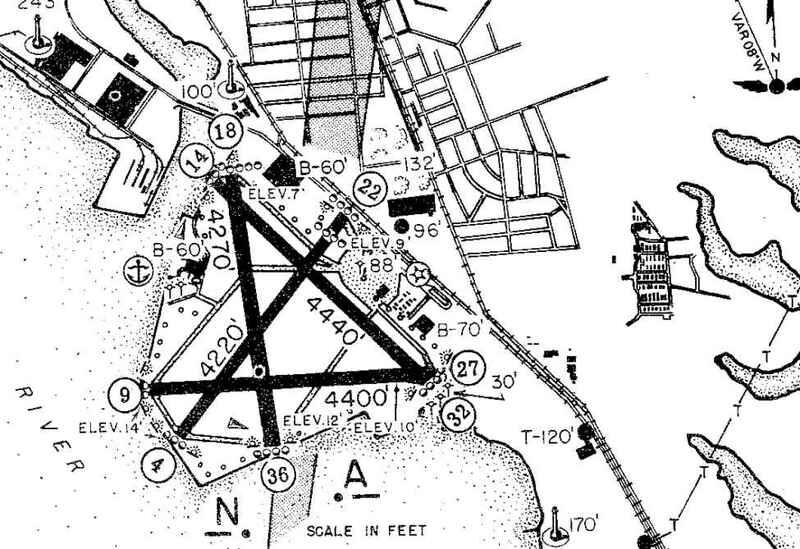 The last depiction which has been located of Logan Field was on the 1943 USGS topo map. “At that time, the United States Army took over the lease. Sentries patrolled the area, and the land was used as part of the war effort as a prisoner of war camp. 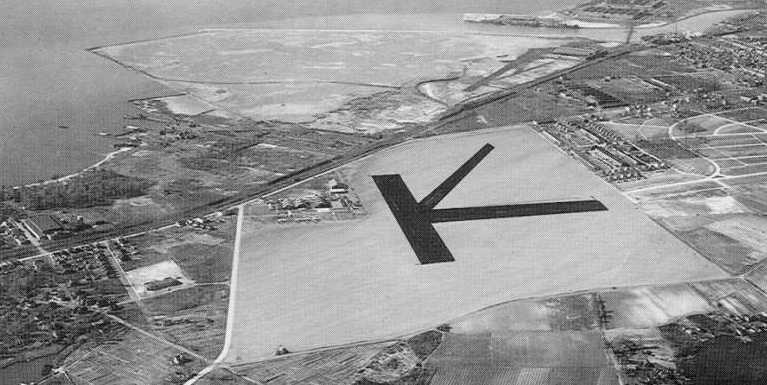 According to the book "Maryland Aloft", the Army's use of the Logan Field property ended after August 1945. The actual date of these tests at Logan Field was not noted. (which would come into vogue 40 years later on such designs as the F-16). 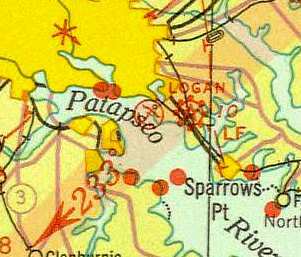 Logan Field was no longer depicted on the 1946 USGS topo map. Housing shortages after WW2 made the Logan Field property valuable for veterans' homes. and the city soon sold its 47 acres." but showed that houses & streets were starting to cover a portion of Logan Field's airfield area. Before long, the north runway had become an athletic field for St. Rita's Catholic Church. Another portion became Logan Village, a shopping center still there. 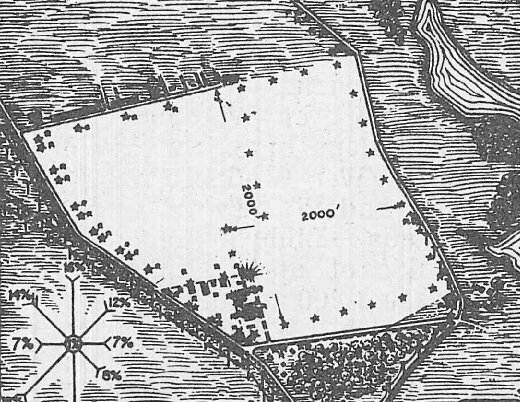 with the property having been covered with houses. A circa 2005 aerial view of the site of the former Logan Airport today, showing no remaining trace of the airfield. reported in 2007 that there were still a few concrete remnants of Logan Field. Young reported, “There are some old foundations that stick up a little. that was used to tie planes down. It's now in our museum." was scheduled to be unveiled on October 20, 2007 at the Logan Village Shopping Center. A December 22, 2007 photo by William Pfingsten of a historical marker commemorating Logan Field, in front of the Logan Village Shopping Center. 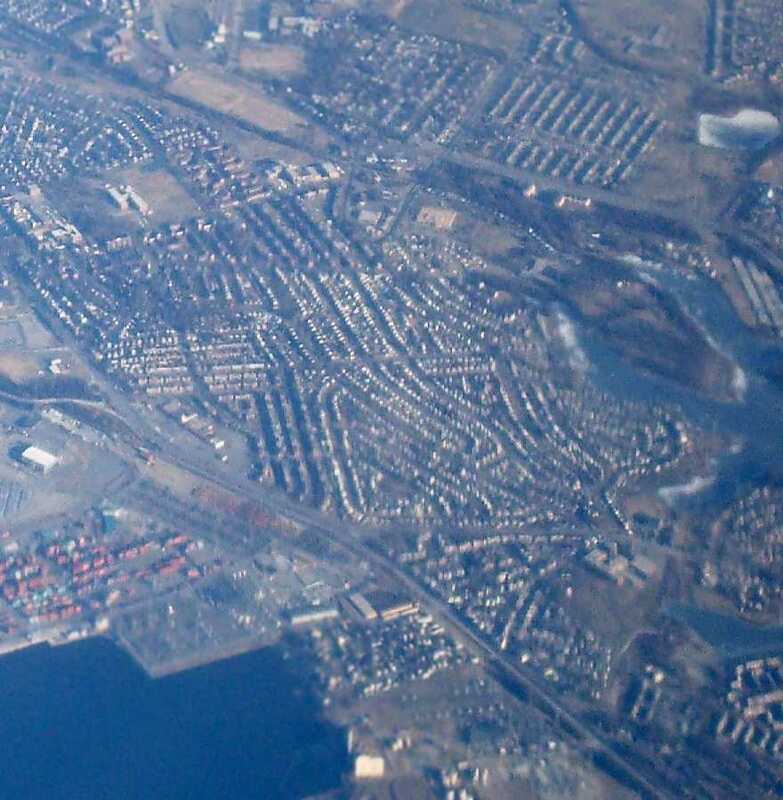 A January 2009 aerial view by Paul Freeman looking north at the site of Logan Airport. 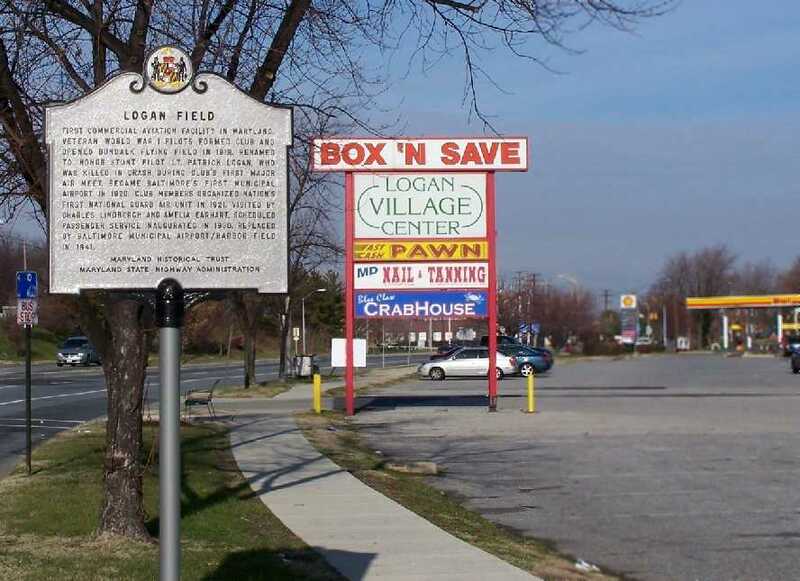 The site of Logan Field is located at the intersection of Dundalk Avenue & Belclare Road. 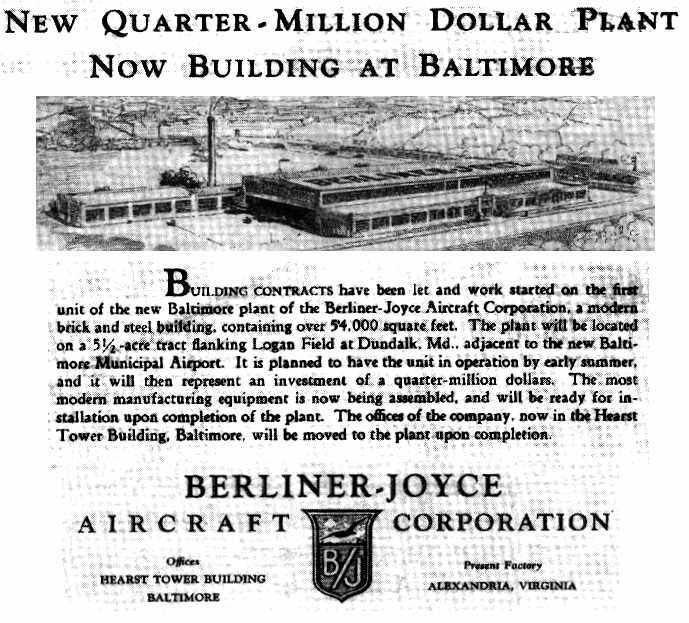 A 1929 advertisement for the new Berliner-Joyce aircraft plant (courtesy of the Enoch Pratt Free Library). on a 5.5 acre site adjacent to the south side of Logan Field. "Enclosing some 54,000 square feet, the brick & stone factory had a rectangular main area. quite an elaborate piece of equipment. between Broening Highway & the Patapsco River." but these plans were thwarted by the 1929 stock market crash, and instead the company relied on military contracts. In 1930, it was acquired by North American Aviation, which changed the company's name to B/J. 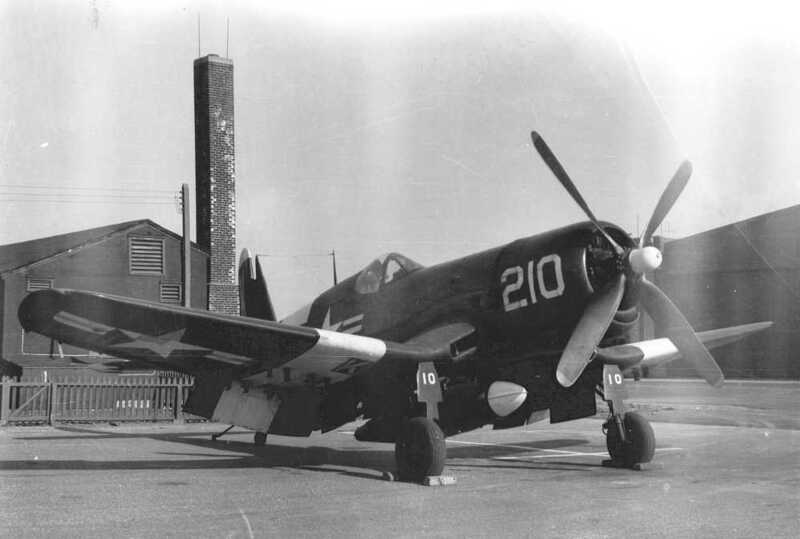 An undated photo of the prototype experimental XFJ-1 biplane fighter in front of the B/J facility in Dundalk. and an experimental XFJ-1 biplane fighter for the Navy. 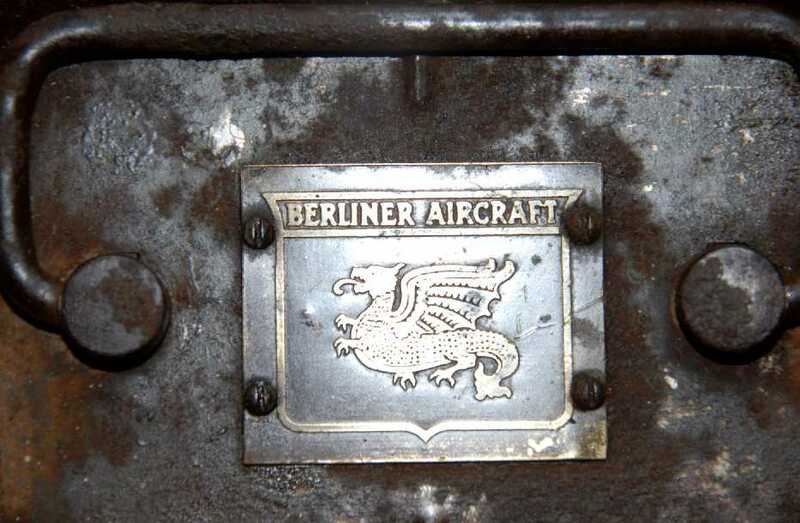 A 2009 photo by Mike Brown of his grandfather's Berliner Aircraft plaque that is attached to his toolbox. with the operations of the former Curtiss-Caproni plant in Dundalk, under the General Aviation name. and saw service with the Army as the O-47. The first aircraft to bear the North American name was built in Dundalk, the NA-16 trainer. The prototype of the Army B-16 was also built here. as North American moved to a new factory in California in 1935.
showing its proximity to the hangars of Logan Field at the top of the photo. where it manufactured a range of military aircraft components. which may have been produced at the Dundalk plant. However, that aircraft was canceled in 1943. Note the 1946 USGS topo map depicted the “General Aviation Tank” as a landmark (presumably the water tank of the former General Aviation factory). 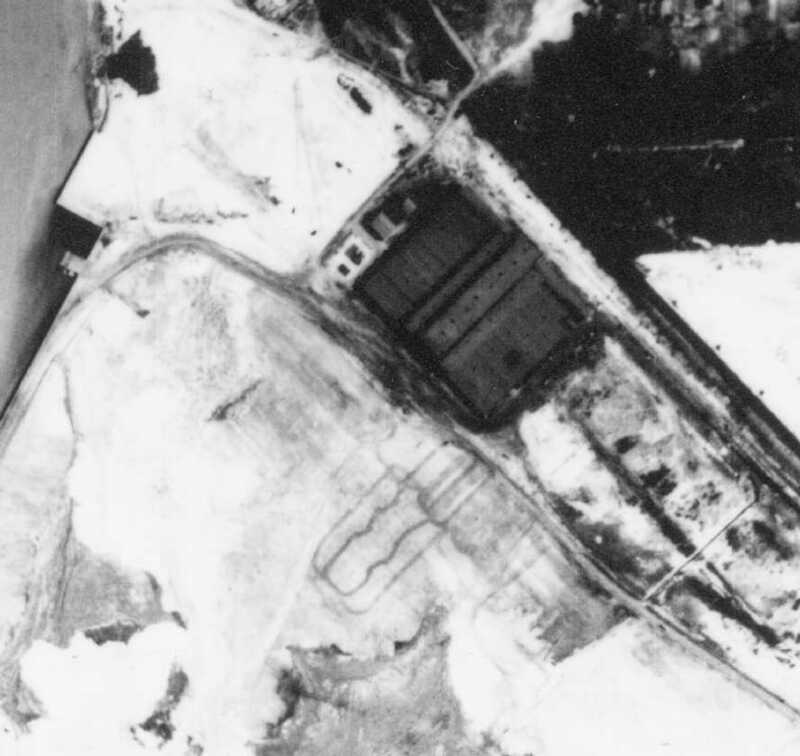 In the postwar era, Allied Aviation turned to the manufacture of boats, and was acquired by Moulded Products Inc. in 1947.
what appeared to be a number of aircraft parking spots were located along a paved area on the north side of the property. 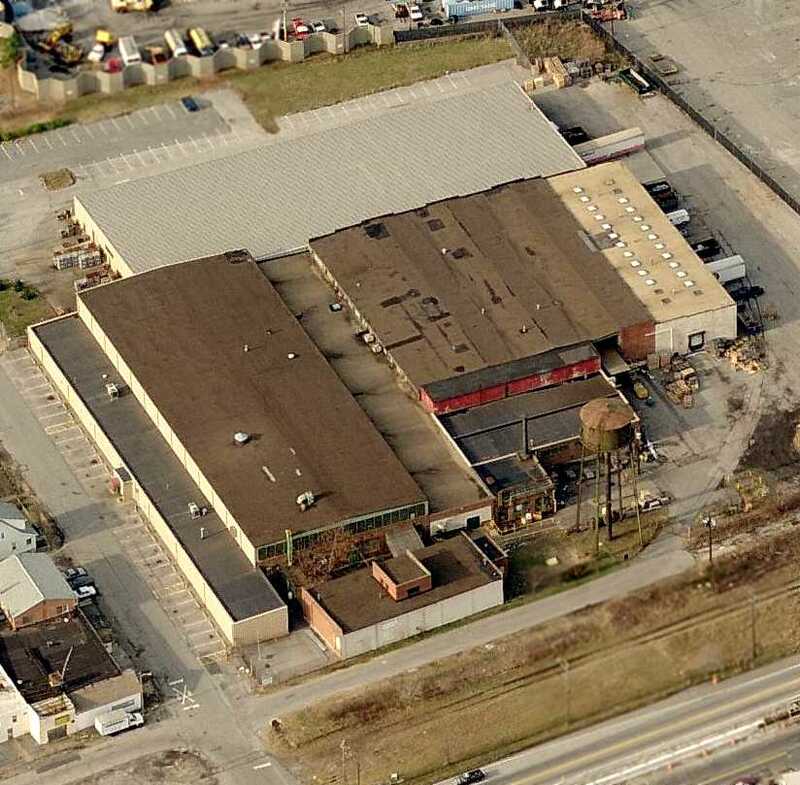 A circa 1990s photo looking west at the former Berliner-Joyce aircraft factory. Louie Armstrong reported in 2005 that according to a friend, "The Berliner-Joyce aircraft factory is active, some kind of an insulation firm." 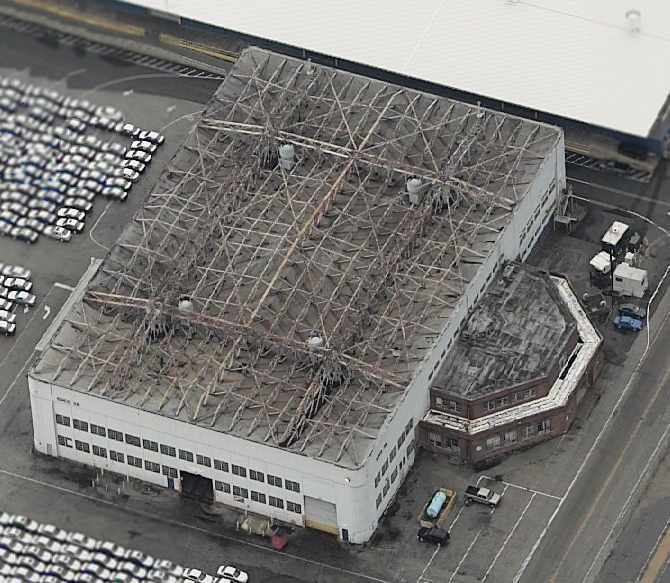 A circa 2006 aerial view looking west at the nearly 60-year-old former Berliner-Joyce Aircraft factory. Jason Henson reported, “The old Berliner-Joyce factory on Maryland Avenue (the old Logan Field site) was torn down in early 2016.
which given its location relative to Logan Field (at top-left), evidently was a precursor to the eventual Baltimore Municipal Airport / Harbor Field. to succeed the much smaller Logan Field. that could accommodate state-of-the-art land & sea planes. The plan was ambitious, and Baltimoreans of the time were praised nationally for their "airmindedness". practically across the street from the field it was intended to replace, Logan Field. 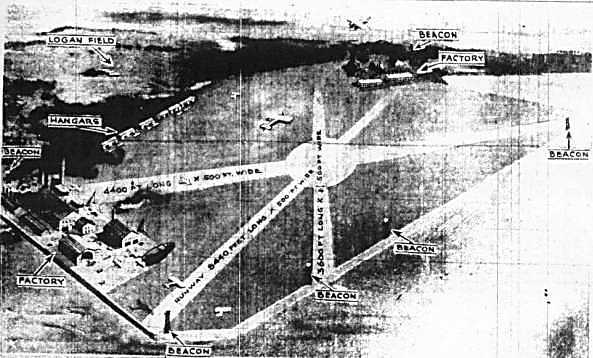 an undated artist's conception of which depicted a field with 3 runways (including one 5,440' long), with factories on either end, and hangars along one side. 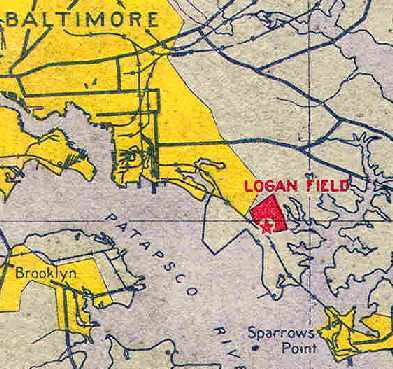 Logan Field was depicted adjacent to the property, which matches the location of what was eventually Baltimore Municipal Airport. 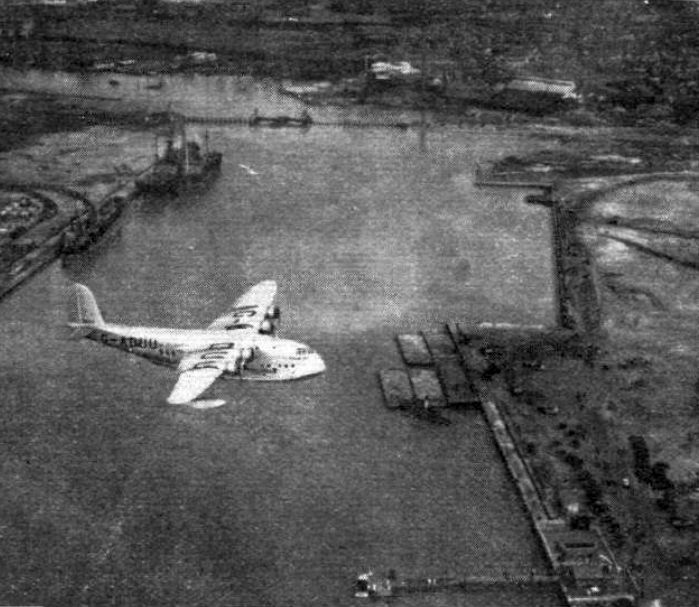 According to the book "Maryland Aloft", construction of Baltimore Municipal Airport began in 1929.
so tons of harbor silt were used as fill as an artificial point into the Patapsco was created for the runways. requiring additional loans & millions of dollars of new federal grants. 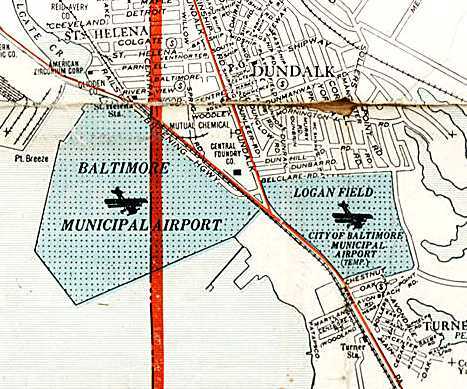 A circa 1930 Cram's street map (courtesy of Greg Stec) depicted “Baltimore Municipal Airport” adjacent to “Logan Field, City of Baltimore Municipal Airport (Temp)”. 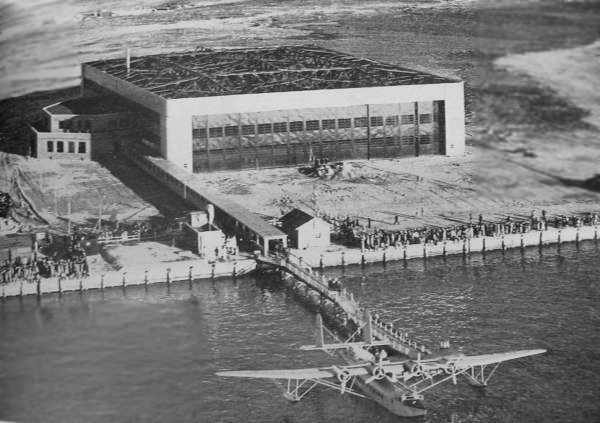 In spite of the difficulties with the land-plane portion of the airport, a flying boat ramp was dedicated in 1932. The earliest photo which has been located of Harbor Field was ironically a 1934 photo by Ray Watson “of my gas-powered model at Harbor Field Baltimore. 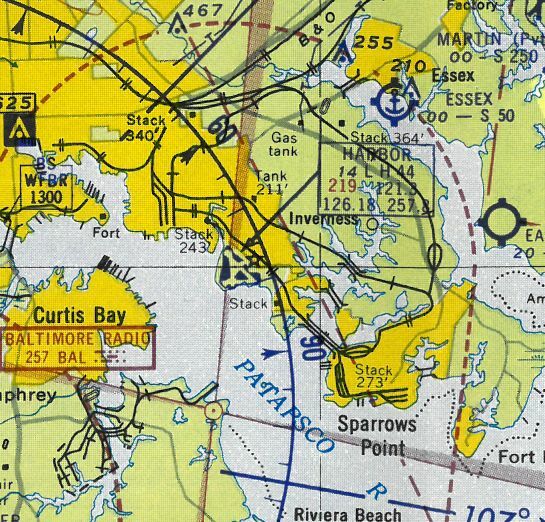 The flying boat base at Baltimore's Municipal Airport was depicted on the 1935 Washington Sectional Chart. 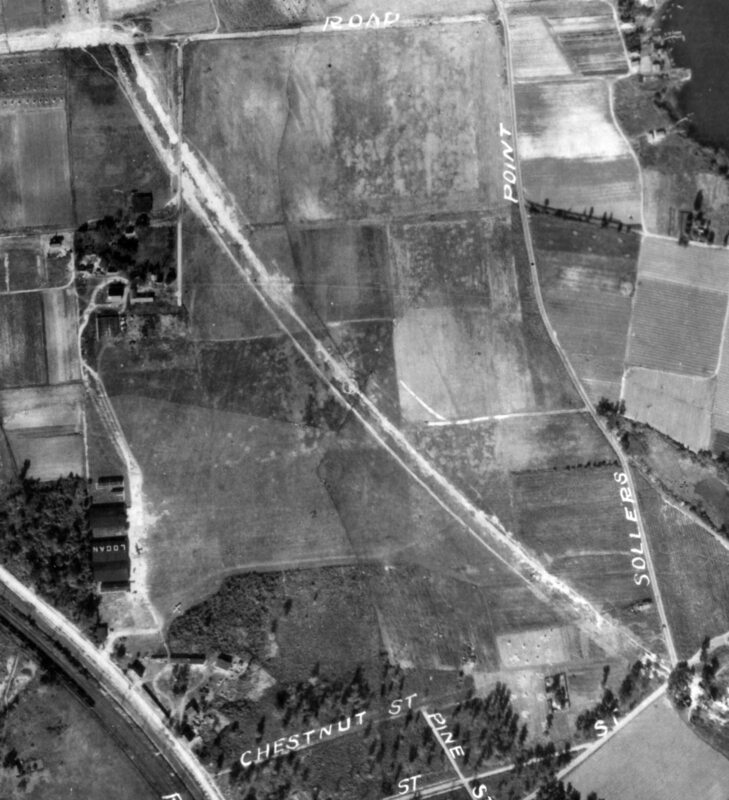 An 11/7/35 aerial view by the MD National Guard's 104th Observation Squadron (courtesy of Wayde Minami) looking southeast at the site of Baltimore Municipal Airport. under which they would commence transatlantic flying boat service within 2 years. which provided hangar space, offices, a passenger concourse, lounge, and observation deck. 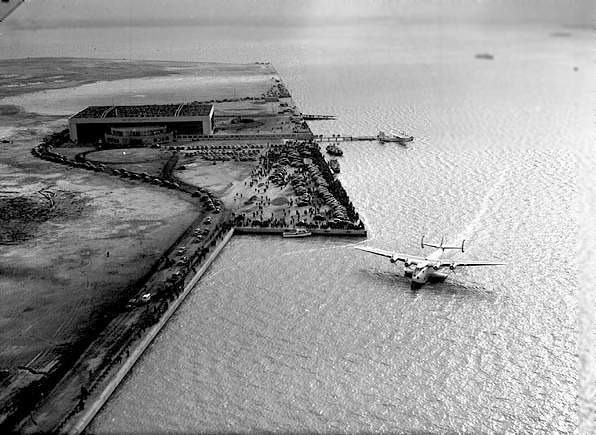 An undated aerial view looking east at a Sikorsky flying boat in front of Harbor Field's terminal (from the Baltimore Pratt Library). 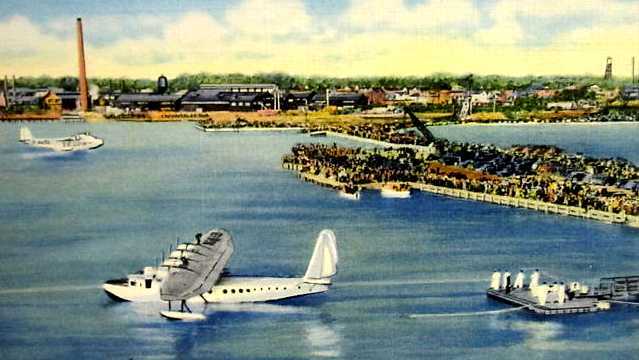 An undated (circa 1930s) postcard of “Seaplanes at Baltimore's Transatlantic Air Base, Municipal Airport Dundalk”. using Sikorsky S-42B flying boats. Note the area in the background which would eventually become the site of Harbor Field was still open & undeveloped. with the seaplane terminal visible at bottom-right, from a 12/23/37 article (courtesy of David Parkinson). and a large empty field in what would eventually be the runways of the landplane airport. did not yet list Baltimore Municipal Airport. landed at Harbor Field on 2/23/39 when she arrived from the West Coast. 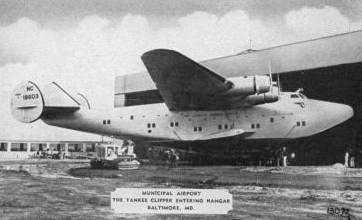 Yankee Clipper made her first trans-Atlantic flight from Baltimore. with 74 paying passengers aboard. However, this configuration was never used for trans-Atlantic flights. A 1939 photo by Robert Kniesche looking southwest at the Boeing 314 “Yankee Clipper” landing at Baltimore Municipal Airport's flying boat facility. and British Overseas Airways (which provided service to Bermuda). In part because the Glenn L. Martin Company in nearby Middle River was very active in building flying boats. At this point in its history, the airport had 20 or so departures & arrivals per day. But the halcyon days of Dundalk's infatuation with the flying boat were brief indeed. In 1939, Pan Am noticed that New York's harbor was usually almost always ice-free too. led the carrier to shift the majority of their flying boat operations northward. But the Baltimore facilities were still used for shorter flights & as a maintenance & repair yard. 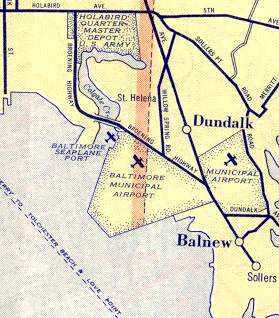 "Baltimore" Airport, as depicted on the 1939 Washington Sectional Chart (courtesy of Chris Kennedy). 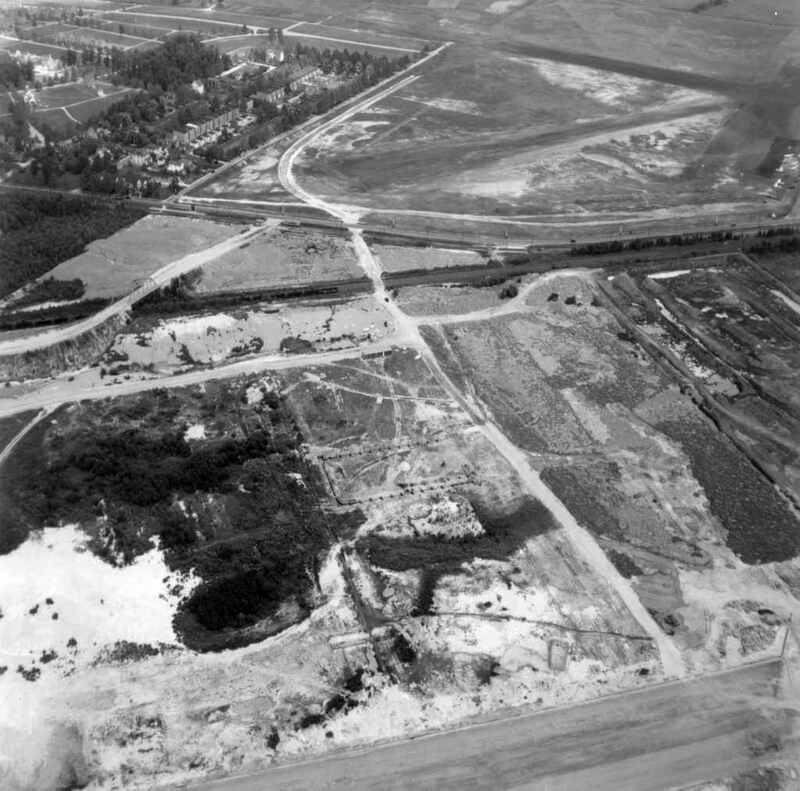 A 9/6/40 aerial view looking east at the construction of Harbor Field, with Logan Field in the background. 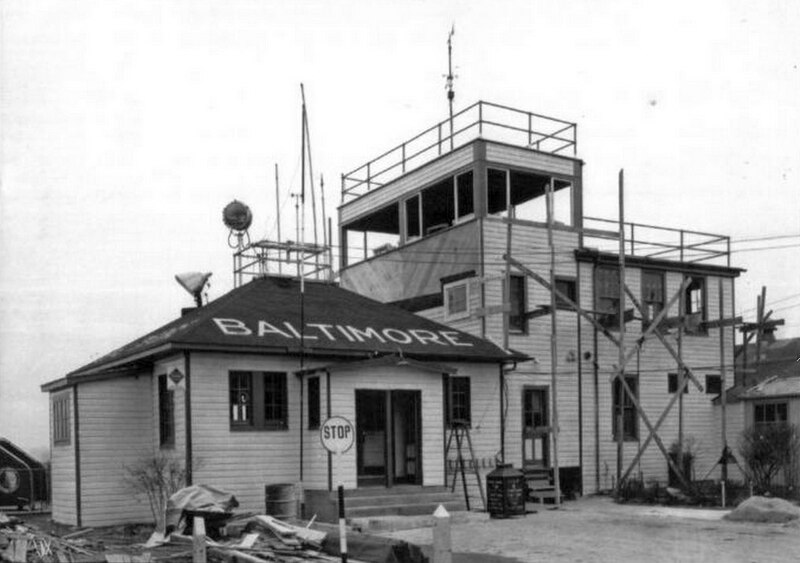 An undated photo of the Baltimore Municipal Airport terminal building & control tower, which appears to show it while still under construction. The land-plane terminal at Baltimore Municipal Airport was built in 1940 in the Art-Deco style. 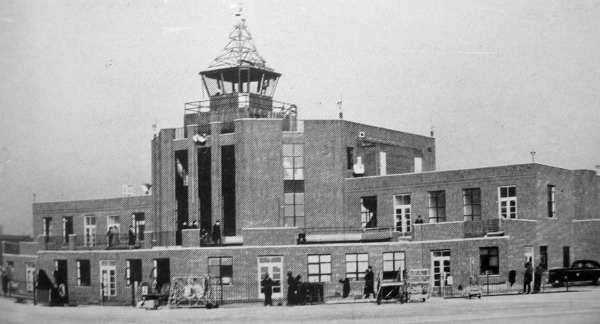 with 2-story wings flanking a octagonal section that was topped with a control tower. Hangar 1 measured 149' x 106'. with adjoining offices & shops. from moving into their purpose-built facilities at Harbor Field until after WW2. to the British Overseas Airways Company. Two of the 3 were delivered in Baltimore. to the United States and British outposts in West Africa and the Caribbean. including a concrete driveway under construction from the highway to the airport. at which point the airport was served by 3 airlines. A flight simulator scenery recreation of Baltimore Municipal Airport by Richard Finley, looking south along Runway 18. 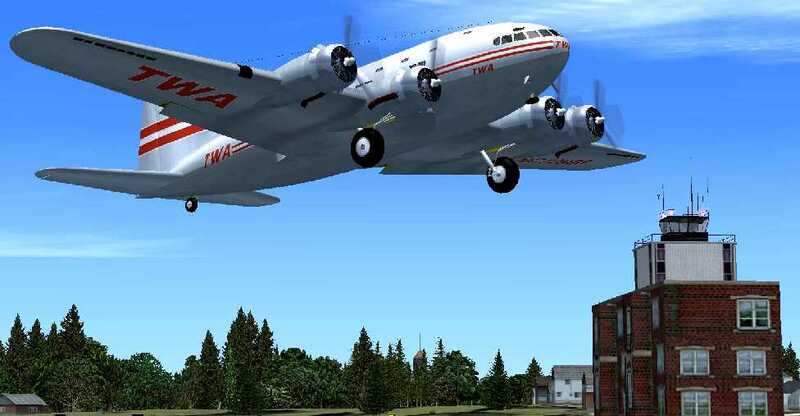 A flight simulator scenery recreation of a TWA Boeing 307 Stratoliner departing from Baltimore Municipal Airport by Richard Finley. And all normal civilian traffic was suspended in 1942 when the War Department took over Baltimore Municipal Airport. and also depicted “Municipal Airport” (Logan Field) across the street to the east. on a 1942 British Overseas Airways flight. 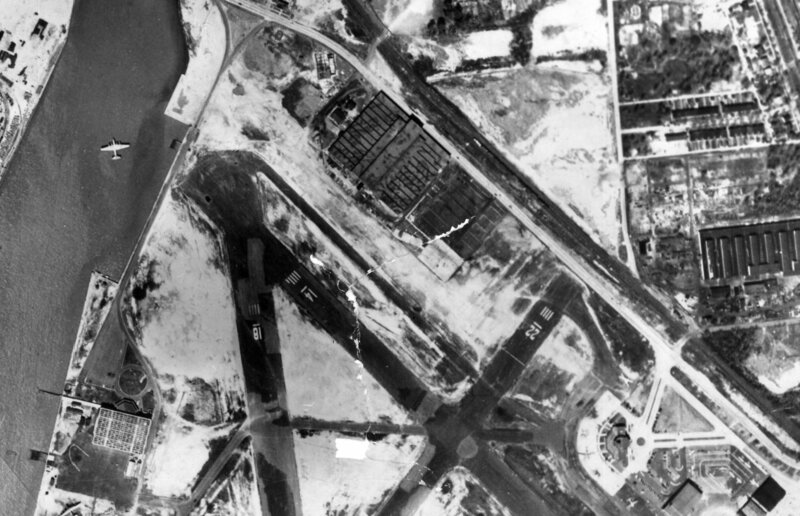 BOAC continued to use Harbor Field as its main U.S. Operating base during WW2. 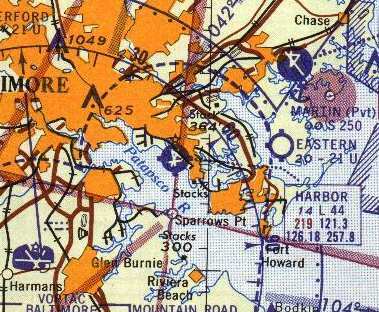 It was depicted as "Baltimore" Airport on the 1942 Washington Sectional Chart (courtesy of Mike Keefe). which moved into the facility in October 1942. The headquarters oversaw subordinate squadrons based at Langley Army Airfield, Richmond Army Airfield and Norfolk Municipal Airport, all in Virginia. 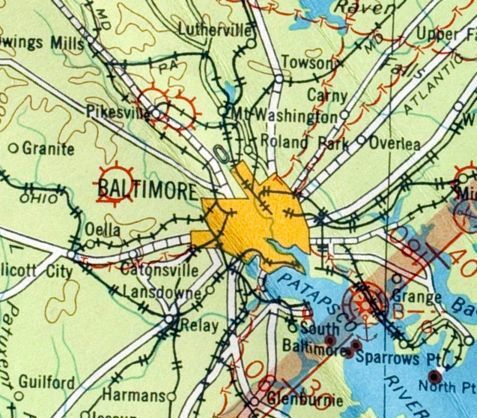 The 1943 USGS topo map depicted both Baltimore Airport & Logan Field. depicted the field as having 4 paved runways. 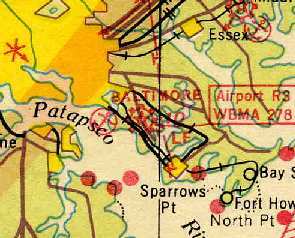 It was depicted as "Baltimore" Airport on the 1944 Washington Sectional Chart (courtesy of Mike Keefe). showing a Sikorsky VS-44 (Excalibur, which had been built for American Export Lines) & a Boeing 314 Clipper. described Baltimore AAF as having a 4,500' hard-surfaced runway. as a 375 acre triangular property within which were 4 asphalt runways, the longest being the 4,535' northwest/southeast strip. The field was said to have 3 metal & brick hangars, the largest measuring 246' x 231'. The field was described as being owned by the City of Baltimore, and operated by the Army Air Force. with 136,000 airline passengers using the field in 1946. The Maryland National Guard finally moved into their purpose-built facilities at Harbor Field in 1946. 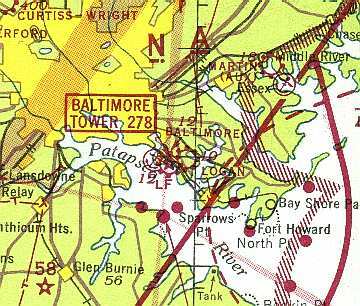 “Baltimore” Airport, as depicted on the 1946 USGS topo map. 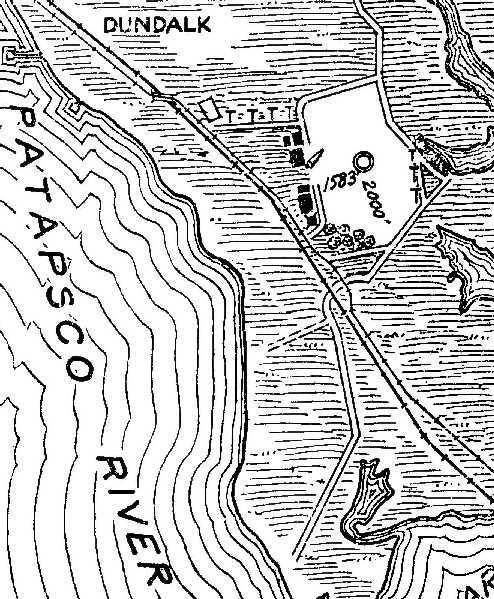 Baltimore “Municipal Airport” was depicted on a 1946 USGS topo map as having 3 paved runways, with several hangars along the east side. according to an article by Clayton Davis. with 3 P-47 Thunderbolt fighters visible on the right foreground & background. with P-47 Thunderbolt fighters visible in the background. A circa 1947 photo of a MD National Guard convoy preparing to depart Baltimore Municipal Airport for summer camp (courtesy of Wayde Minami). 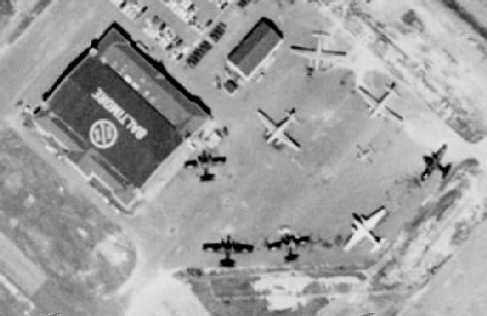 Two MD National Guard Douglas C-47s are paked behind the hangar, and a visiting North American B-25 Mitchel is at bottom-right. According to Bob Mattingly, “BOAC made its last Baltimore to Bermuda flying boat flight in January 1948.
which went under in a sea of red ink & the planes ended up parked at Harbor Field. The popularity of the flying boats waned, as decent runway facilities were built for the major cities. The beautiful & temperamental flying boats fell into disuse. So did Baltimore's flying boat terminal. A 1948 photo by William Ebert (used by permission of Colin Ebert) of a Boeing 314 Clipper flying boat, anchored off of Baltimore Municipal Airport. it quickly became clear that the base would not be the Guard's permanent home. inadequate to accommodate the new, heavier planes that had been developed. and dashed Baltimore's dream of becoming the leading flying boat port of the world. The airport's use was limited to smaller, lower-capacity planes, and the site proved unprofitable. as they continued to settle into the filled-in land. An undated (circa 1940s?) 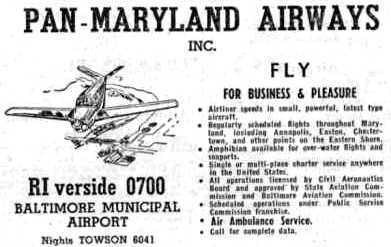 advertisement for Pan-Maryland Airways at Baltimore Municipal Airport. An undated (circa 1940s?) 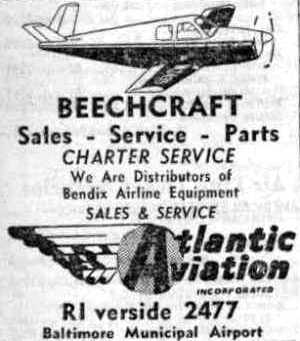 advertisement for Atlantic Aviation at Baltimore Municipal Airport. A 7/15/48 photo of the MD National Guard's Republic F-47 Thunderbolts at Harbor Field (courtesy of Wayde Minami). 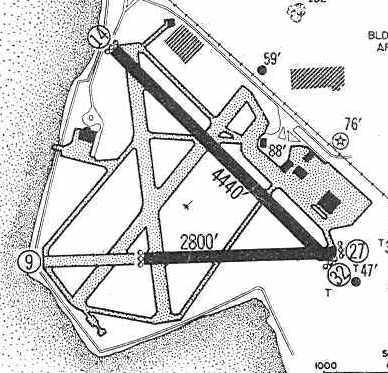 depicted the field as having 4 paved runways, with the longest being the 4,440' Runway 14/32. 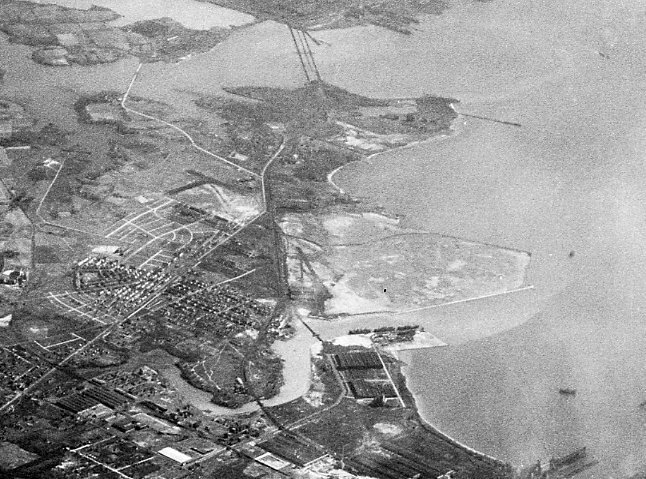 A 1948 City of Baltimore aerial photo of the northwestern portion of Baltimore Municipal Airport (from the Johns Hopkins Sheridan Library), showing a Boeing 314 Clipper flying boat anchored in the water at top-left. 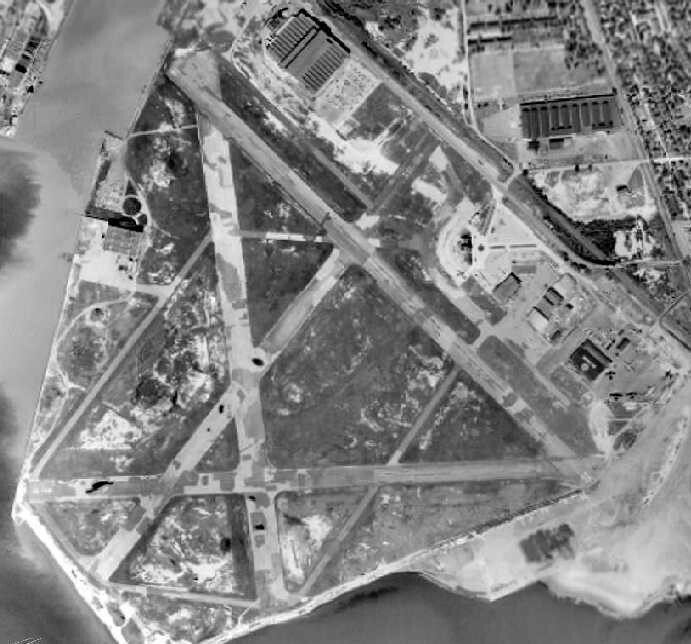 A 1948 City of Baltimore aerial photo of the southwestern portion of Baltimore Municipal Airport (from the Johns Hopkins Sheridan Library), showing a large number of aircraft parked on the National Guard ramp at top-right. A 1949 photo of a Navy F4U-4 of VF-32 at Harbor Field. According to Wayde Minami, “The F4U Corsair is probably a Navy Reserve plane. The Navy Reserve used the field from time to time after WWII (they weren't based there, just used the field). 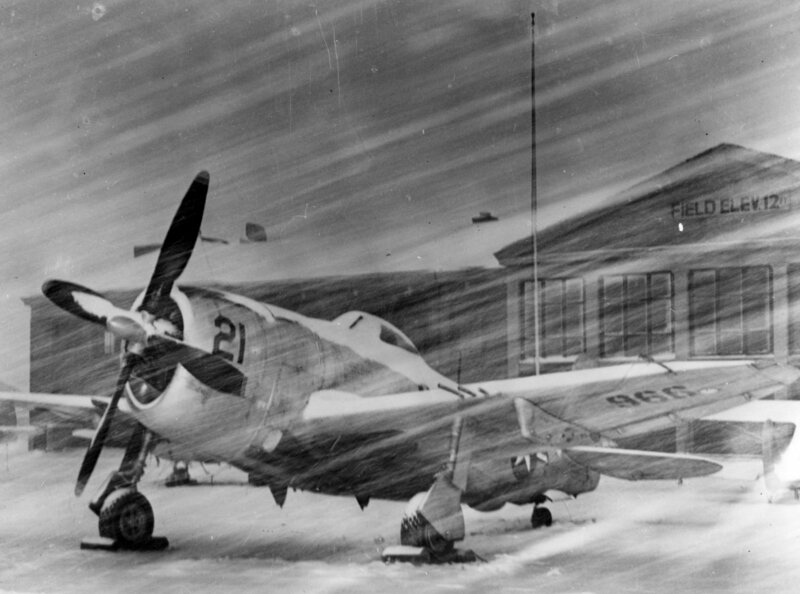 A circa 1949 photo of a snow-covered Republic F-47 Thunderbolt in front of the MD National Guard's hangar at Harbor Field (courtesy of Wayde Minami). A circa late 1940s photo of the MD National Guard's hangar at Harbor Field (courtesy of Wayde Minami). A 5/15/50 photo of the MD National Guard's fulltime Air Technical Detachment in front of their Republic F-47 Thunderbolts at Harbor Field (courtesy of Wayde Minami). 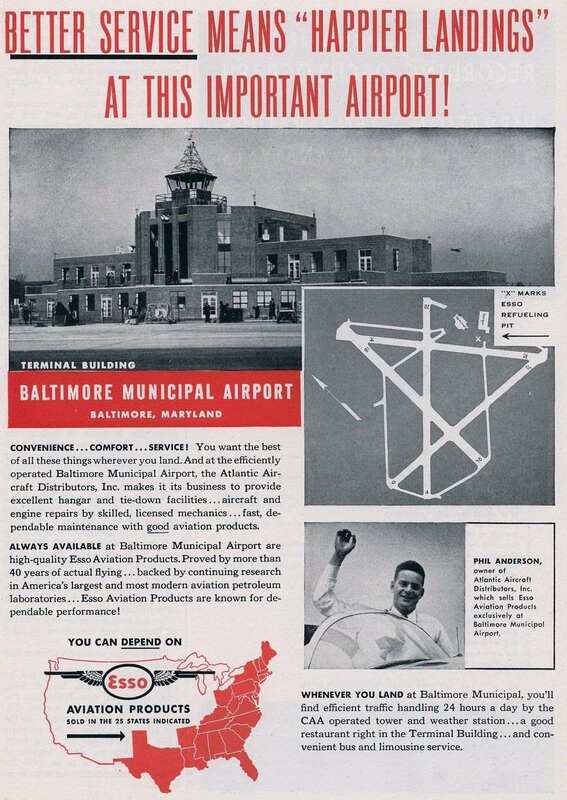 A July 1950 advertisement for Baltimore Municipal Airport. with purpose-built runways that were sized to accommodate the coming jet airliners. and the older airport was renamed Harbor Field. numerous taxiways, and a large ramp surrounding the control tower along Broening Highway. the base's short runways - it's longest was only 4,520' - would be inadequate once the unit converted to jet operations. to operate training classes for radar operators. during the 1950s Harbor Field "remained an Air Guard base and continued to serve private pilots & business aviation." An undated (circa 1950s?) photo of the Harbor Field terminal building & control tower. using 3 Link Trainers, 4 Stinson 108s, and 10 Cessna 182s. parked on either side of the National Guard hangar on the east side of Harbor Field. 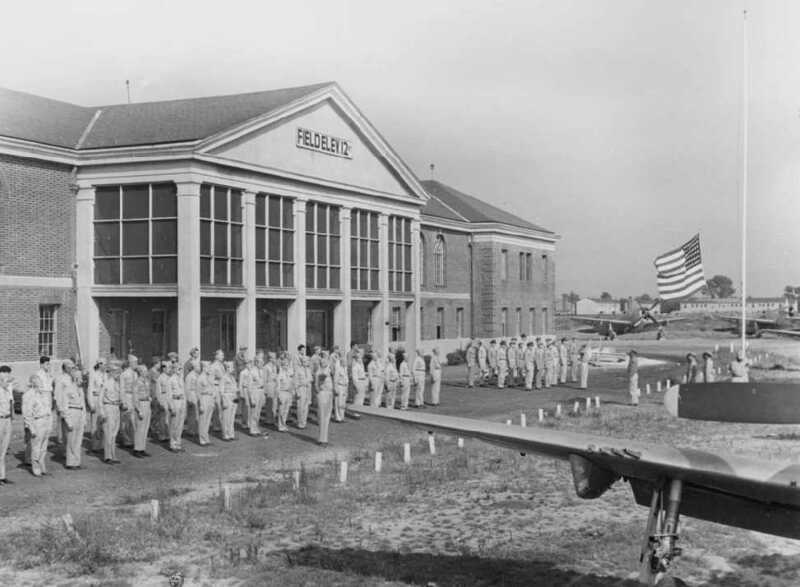 According to the MD Air National Guard's website, “Beginning in 1953, Guard officials began looking in earnest for a new home for the unit, but with little success. 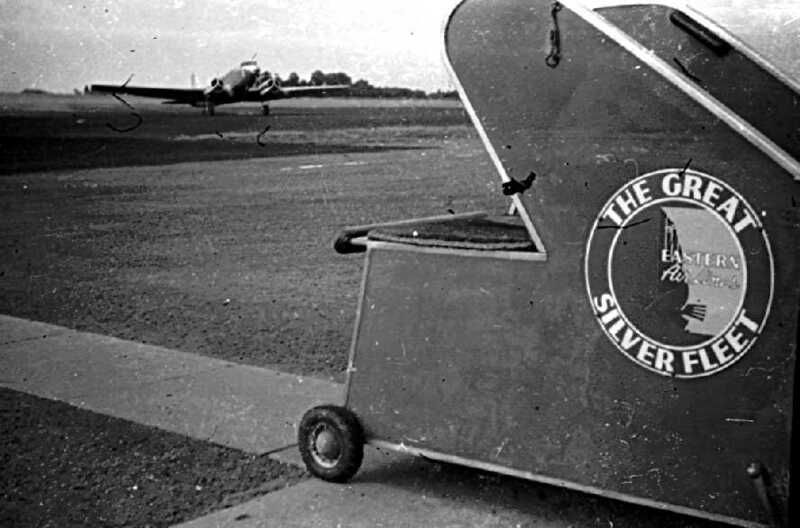 and on 9/10/55, a second flying unit, the 135th Air Resupply Group, was activated at Harbor Field. The National Guard's 135th Air Commando Squadron flew the HU-16 Albatross amphibian starting in 1956. In July 1955, the Martin Company offered space on a 25-acre tract on the north side of its airfield in Middle River. with Runways 9/27 & 14/32 as the only remaining open runways. as having 4 paved runways, with the longest being 4,400'. 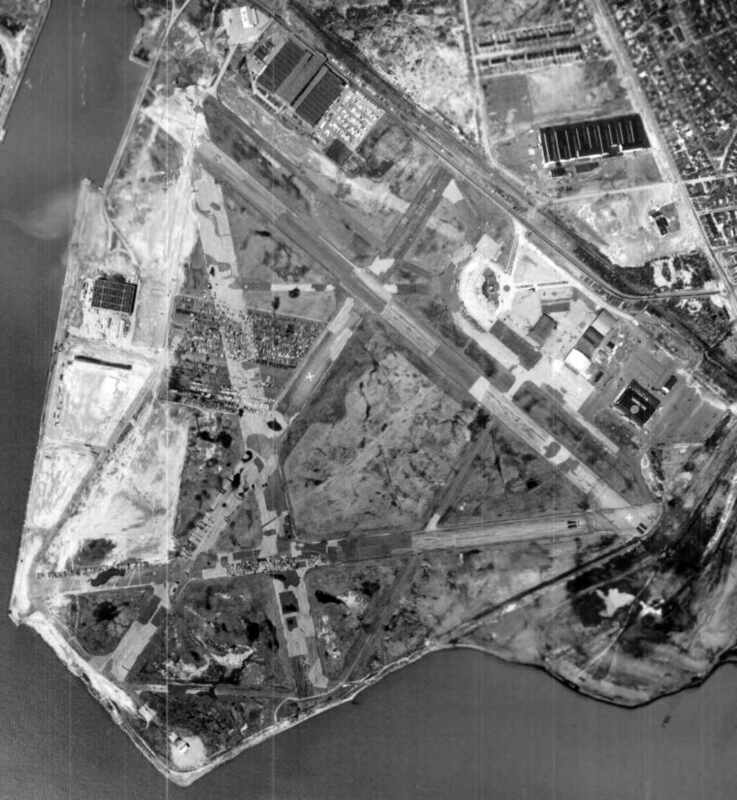 The last photo which has been located showing Harbor Field still in operation was a 1957 aerial view. Although still operating, the runways appeared to be in extremely rough condition. Note also the former Curtiss-Caproni / General Aviation Manufacturing factory on the north side of the airport. and 1 smaller aircraft parked next to the National Guard hangar on the east side of Harbor Field. which was transferred to the Maryland Port Authority for conversion into a marine terminal", still operating today as the Dundalk Marine Terminal. 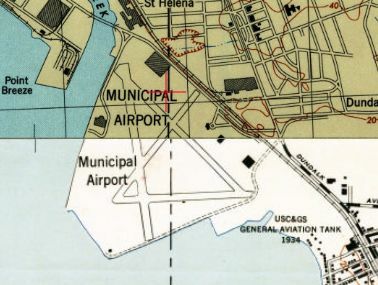 Harbor Field, as depicted on the 1960 Washington Local Aeronautical Chart (courtesy of Mike Keefe). with only a 4,400' Runway 14/32 & a foreshortened 2,800' Runway 9/27. "On the last day of 1960, a ceremony marked the closing of Harbor Field." It was labeled "Closed" on the 1961 Washington Local Aeronautical Chart (courtesy of Mike Keefe). 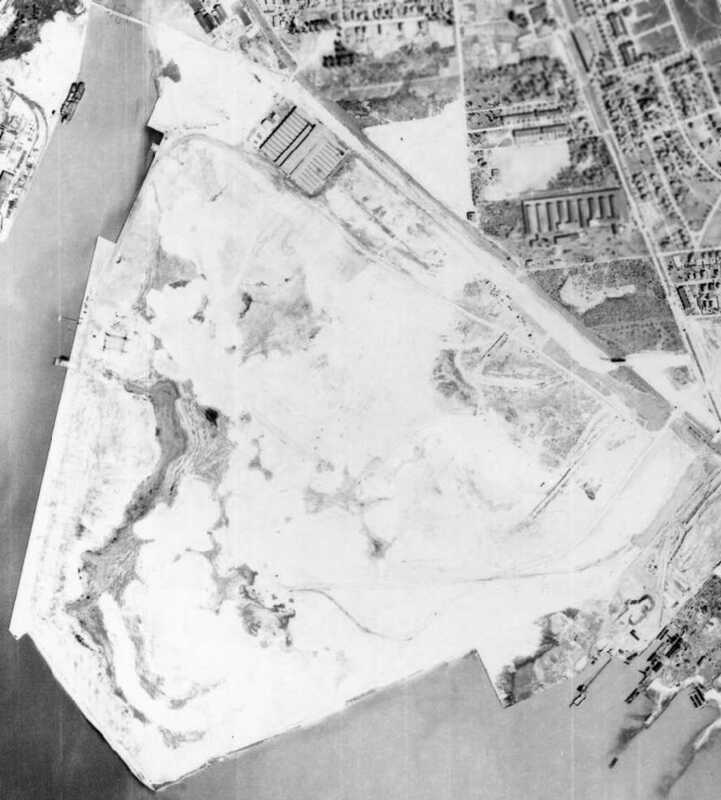 The last photo which has been located showing Harbor Field still largely intact was a 1961 aerial view (courtesy of Elliott Plack). although many new buildings had been constructed over the site for the new marine terminal. 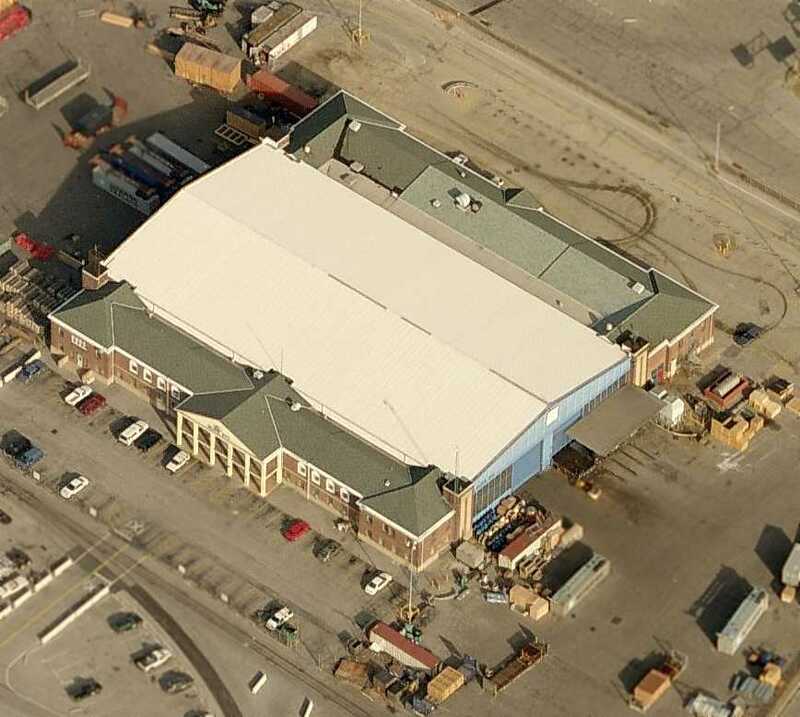 The National Guard hangar still bore the “Baltimore” lettering on its roof. 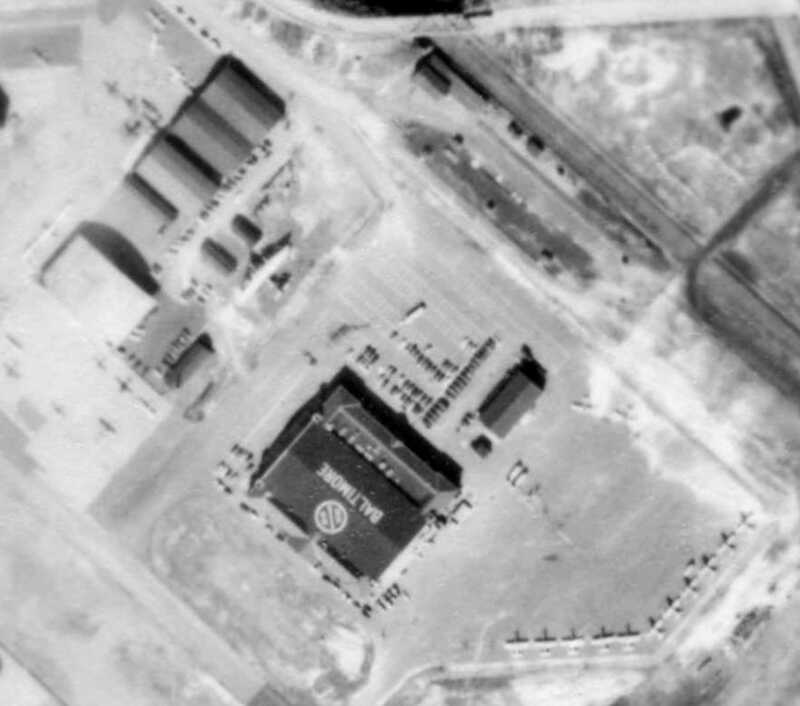 A 1966 aerial view showed that the former National Guard hangar had lost its “Baltimore” lettering at some point in the previous 2 years. Jack Fromm recalled, “Harbor field... in 1965, I got my first summer job working at George Transfer & Rigging Company, which to my delight, was located in the old terminal building. 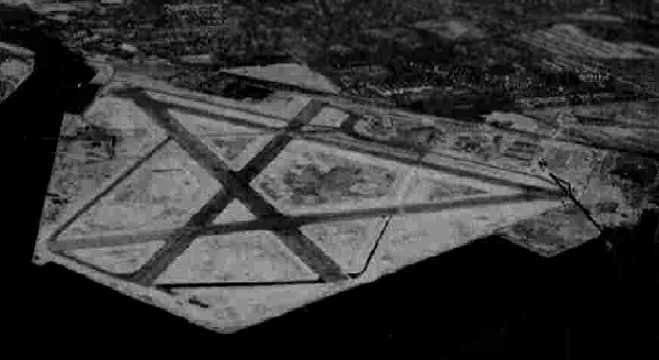 A 1971 aerial view showed that the traces of the former runways had become almost invisible. 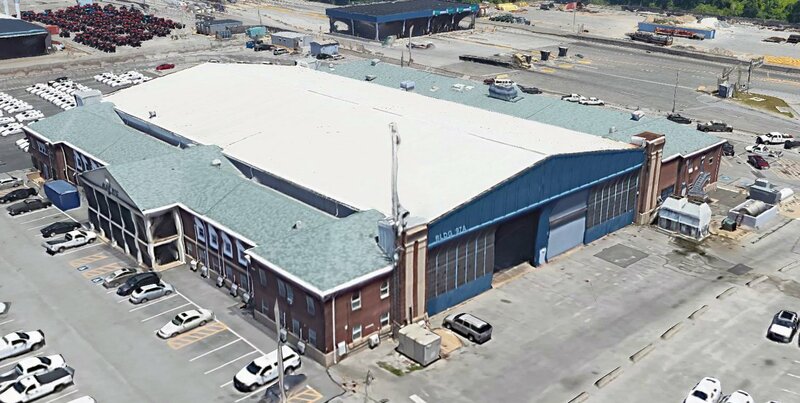 the old flying boat terminal was incorporated into the new building plan. It was reused as Shed 3B, housing equipment & offices for a stevedore company. The control tower remained & was used for a variety of purposes over the years. Most recently, the tower was the home of the port police at the terminal. and the police abandoned the building for more modern quarters in the late 1990s. the Pan American terminal, the Air Station, Hangar #1, and the Air Guard Building. based on their innovative design features & their association with local transportation history. further documented the 4 buildings." 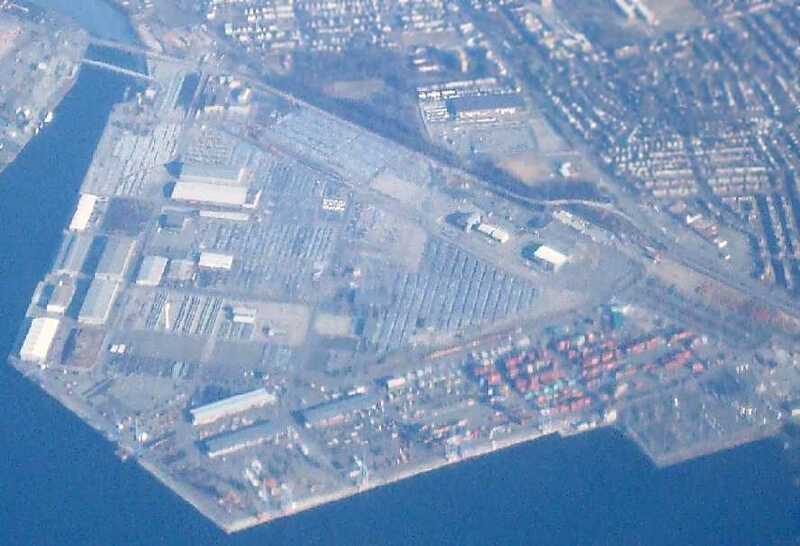 A 2001 aerial view of the site of Harbor Field (now the Dundalk Marine Terminal). A recent view of the former flying boat terminal at Harbor Field. which remained standing (for the time being) atop its administration buildingat the Dundalk Marine Terminal. The building was empty, with numerous broken windows. A spokeswoman for the Port Administration said in 2002 it planned to demolish the tower building within the next year or so. and another piece of Maryland's rich aviation history was destroyed without any recognition. and my current work assignment takes me to Dundalk Marine Terminal every day. 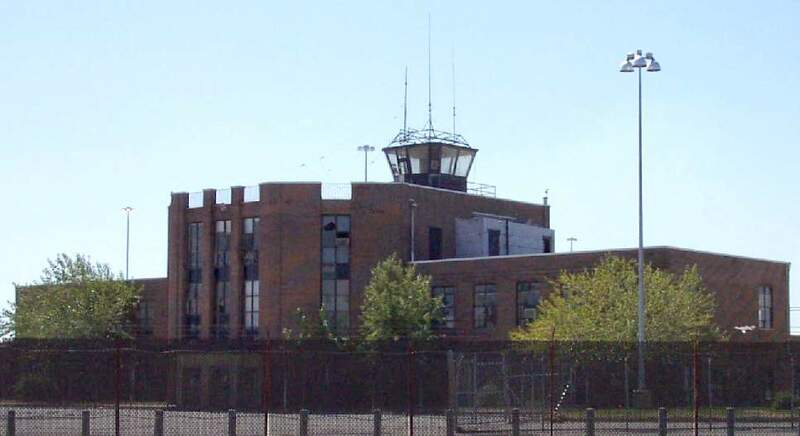 the old tower & terminal building was torn down to make way for other uses of the area in the terminal. Such a shame that no one even reported it in any of the newspapers that I am aware of." 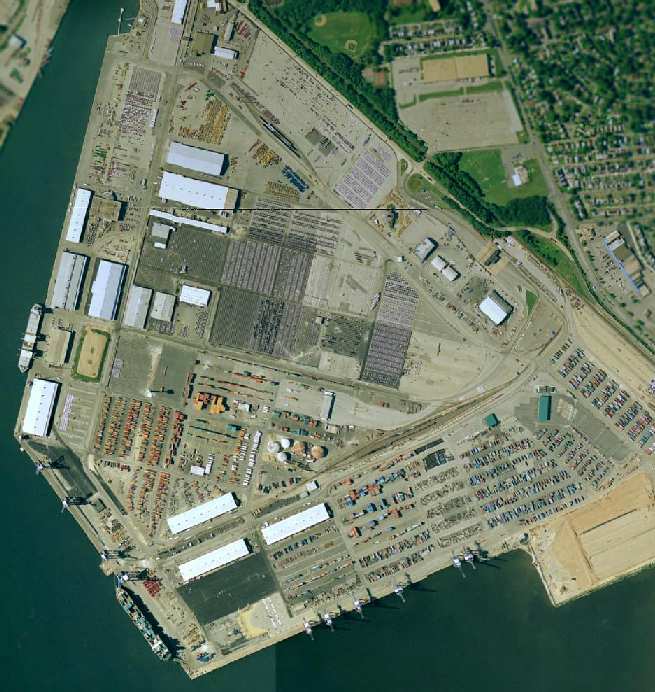 A circa 2004 aerial view looking west at the former flying boat terminal building which remained along the west shore of the site of Harbor Field. replaced with a parking lot filled with more cars, leaving no trace of the historic building. A 2005 aerial photo also showed that the 1939-vintage flying boat terminal building along the western shore had been removed. A circa 2005 aerial view looking east at several former hangars which remain standing on the northeast side of the site of Harbor Field. 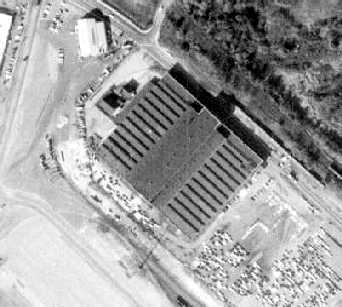 A circa 2007 aerial view looking north at the 1946 vintage MD Air Guard hangar which remains standing on the east side of the site of Harbor Field. someone from the Dundalk Marine Terminal came in & dropped off the dedication plaque from what had formerly been the ANG hangar there. A January 2009 aerial view by Paul Freeman looking north at the site of Harbor Field. A 2017 3-D aerial view looking north at the 1946 vintage MD Air Guard hangar which remains standing on the east side of the site of Harbor Field. The site of Harbor Field is located west of the intersection of Broening Highway & Dundalk Avenue. Thanks to Ray Stinchcomb for pointing out this field. "The Curtiss-Caproni Corporation was established in 1929 as a division of the Curtiss-Wright Corporation. in building large, multi-engine aircraft. 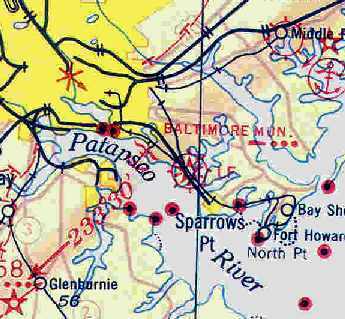 the city of Baltimore was developing for its planned water-side airport [Baltimore Municipal Airport]. 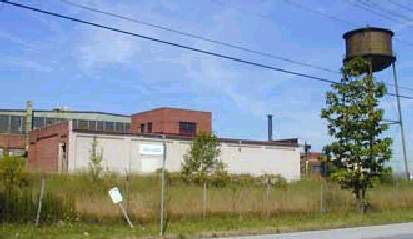 The factory's location in Dundalk was just east of Colgate Creek & within Baltimore's municipal limits. Completed in 1930, the plant was designed to accommodate up to 2,000 workers. It enclosed 200,000 square feet under saw-tooth roofs." The plant was located adjacent to the north side of the Baltimore Municipal Airport. and the General Aviation Manufacturing Corporation leased the facility in 1931. General Aviation manufactured Coast Guard flying boats at the plant, among other things. and North American relocated General Aviation's work to its other Dundalk subsidiary, B/J Aviation (near Logan Field). 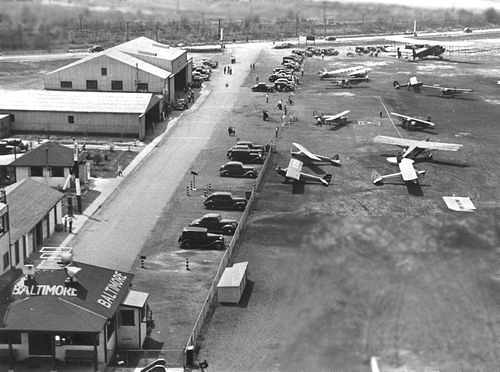 and North American began moving all of its operations out of Maryland in 1935.
showing the large building on the north side of Baltimore's Municipal Airport (Harbor Field). 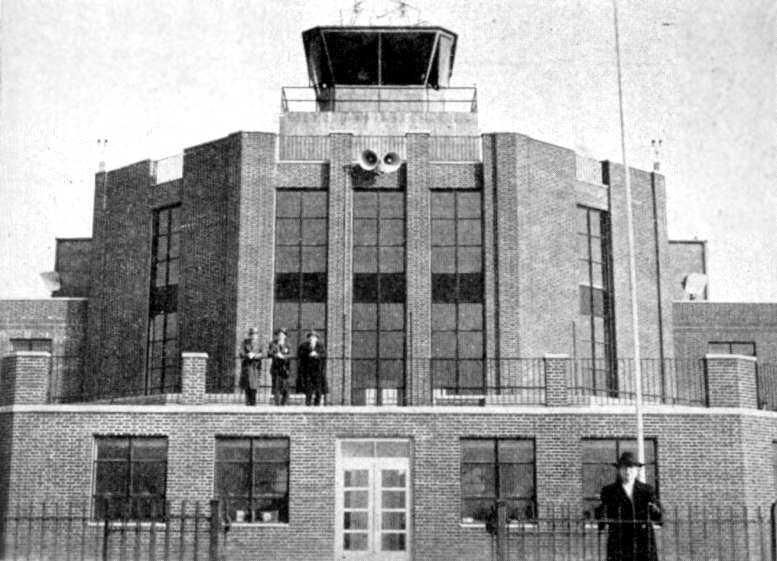 before their own facilities at Baltimore Municipal Airport were completed in 1938.
but determined in 1941 that reconditioning the facility would be too expensive. which used it to manufacture cable. The former Curtiss-Caproni factory was acquired in 1955 by Bendix Aviation Corporation. 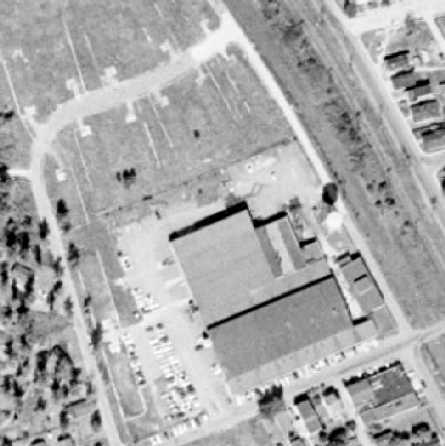 The last photo which has been located of the former Curtiss-Caproni factory was a 1971 aerial view. 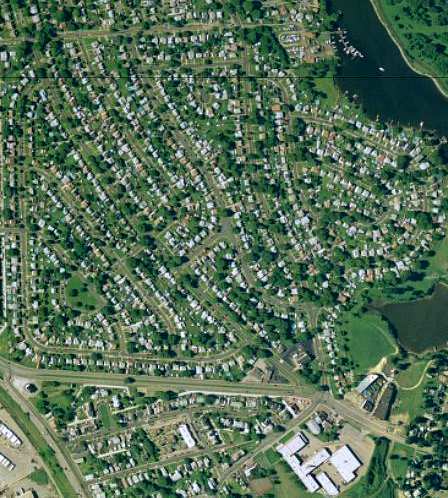 as the 1995 USGS aerial photo showed that it had been replaced by a parking lot.